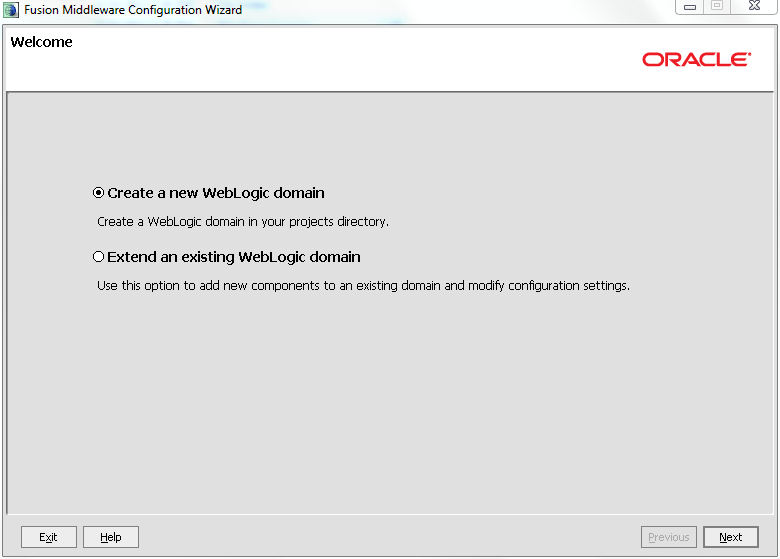 Install WebLogic Server 12c on Windows, create a new domain, and deploy a sample application, all in 30 minutes or less! 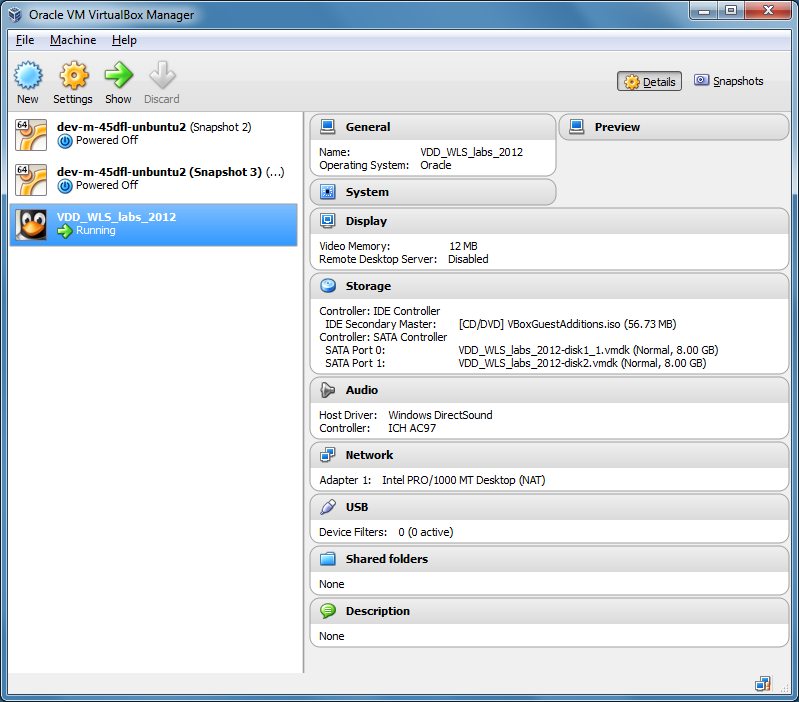 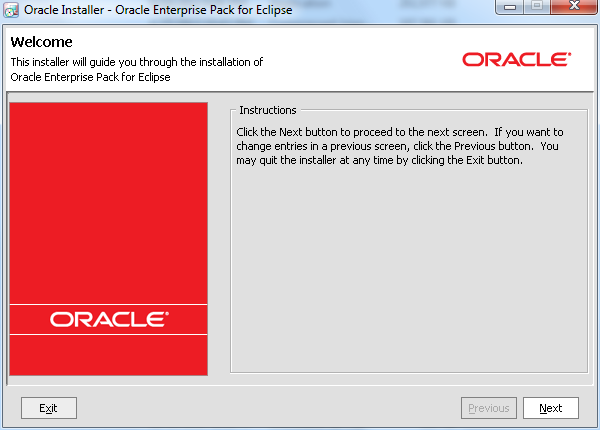 A quick overview of the entire process, installation to deployment. 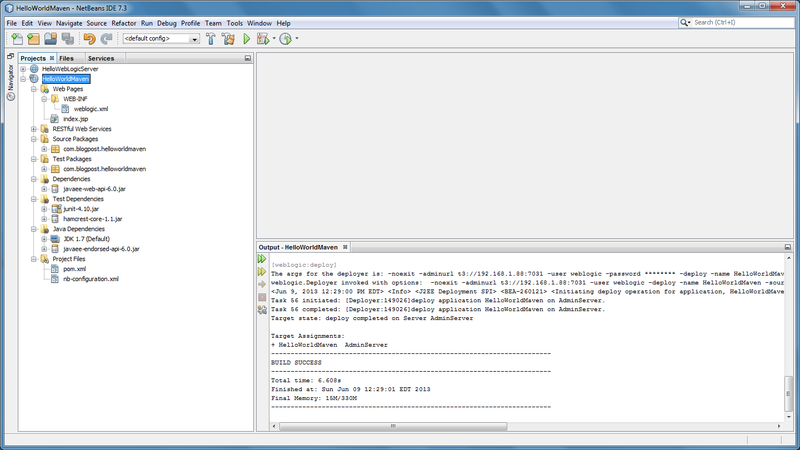 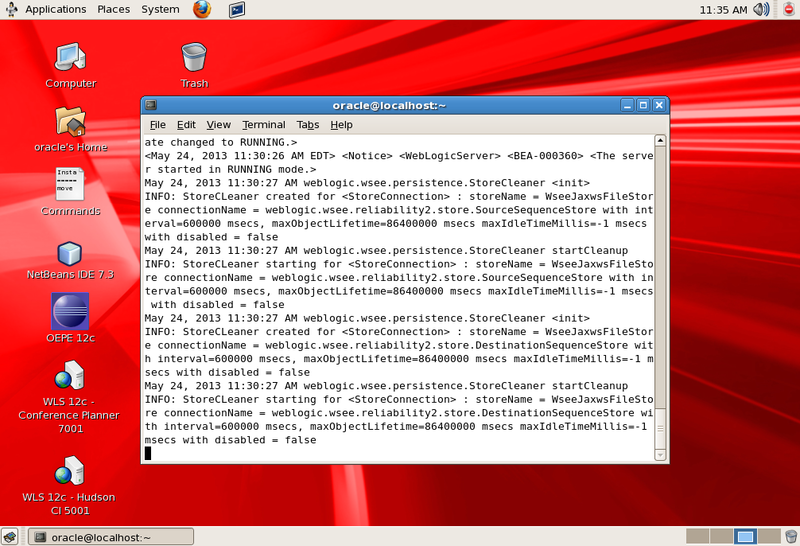 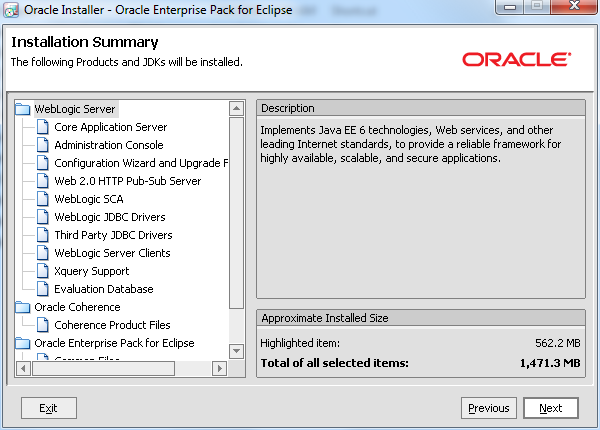 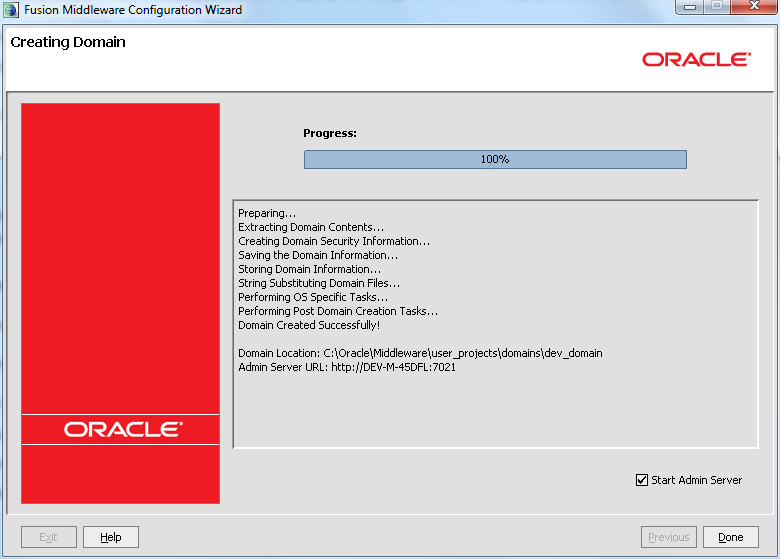 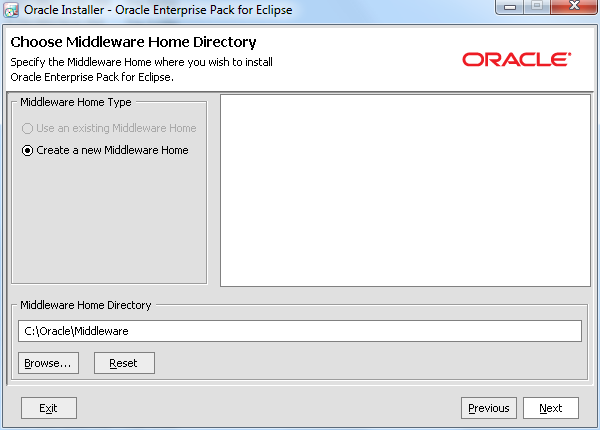 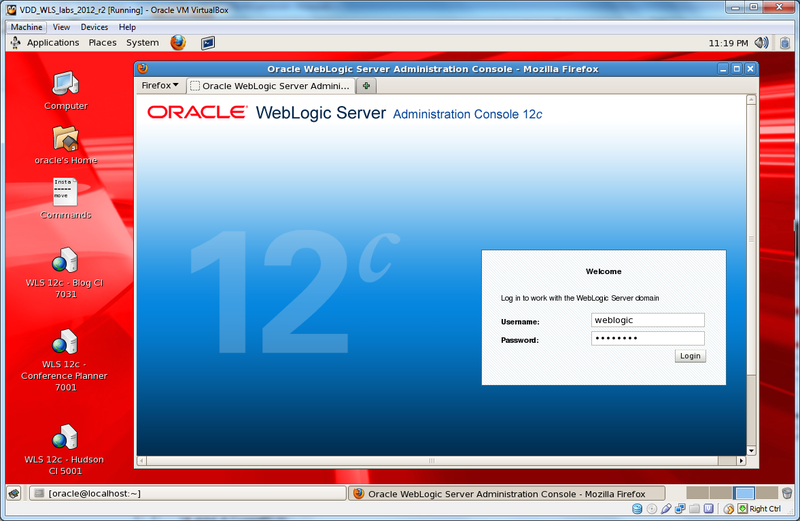 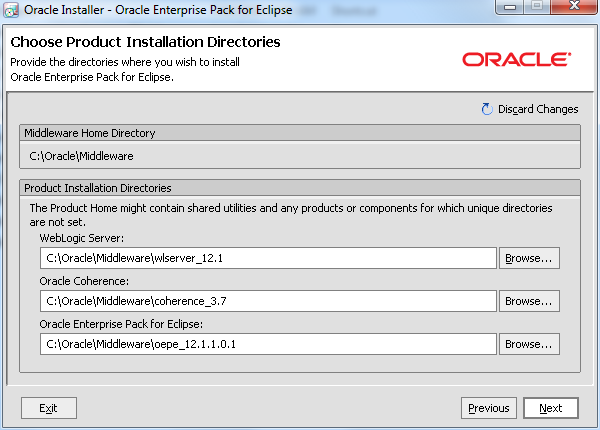 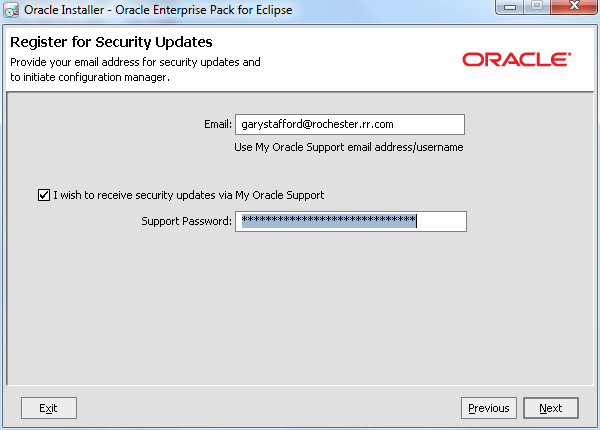 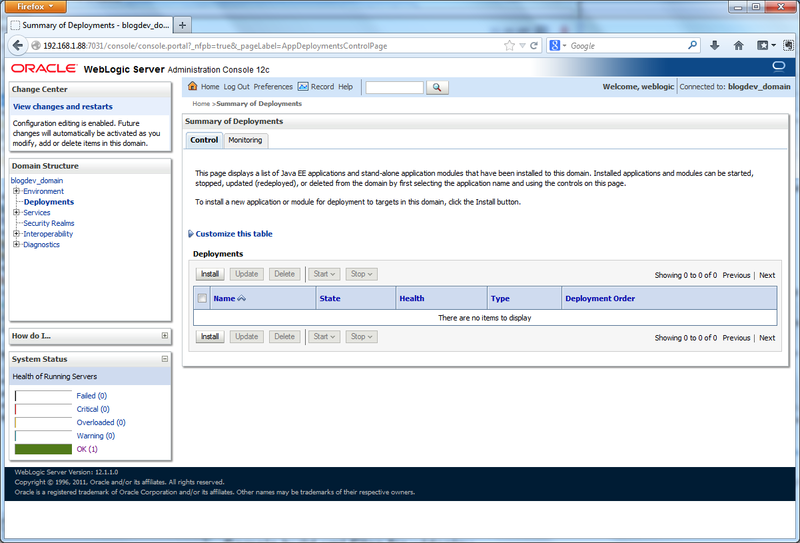 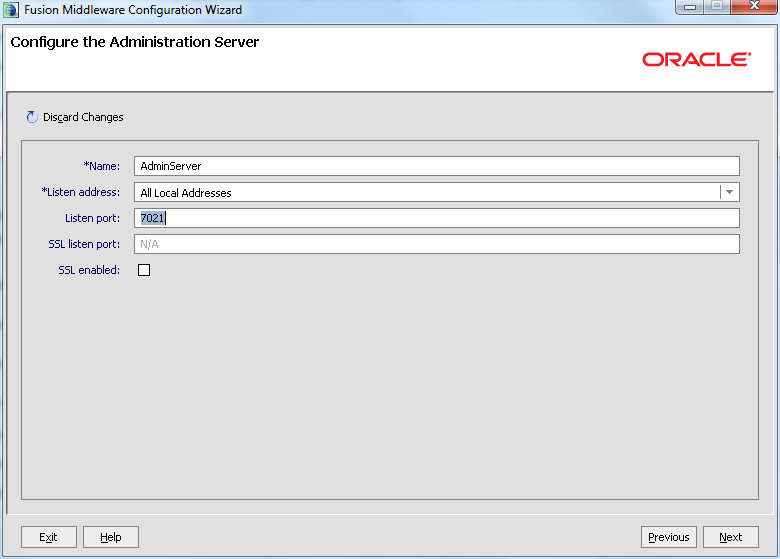 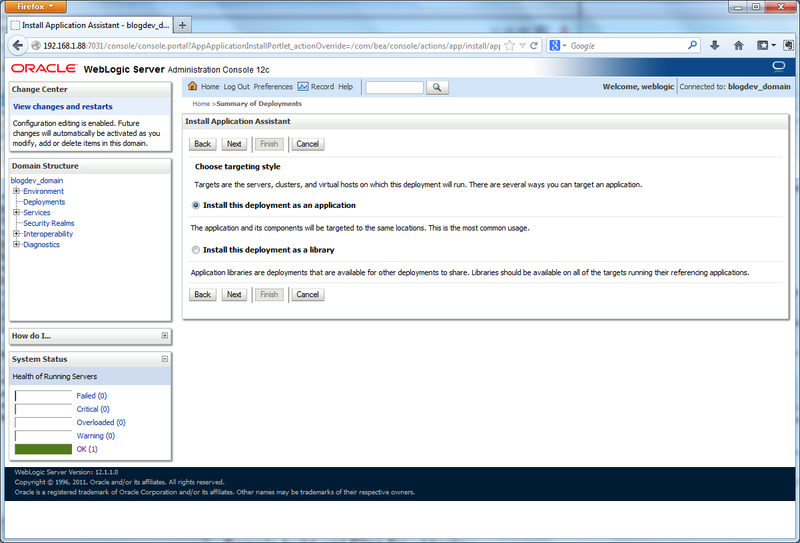 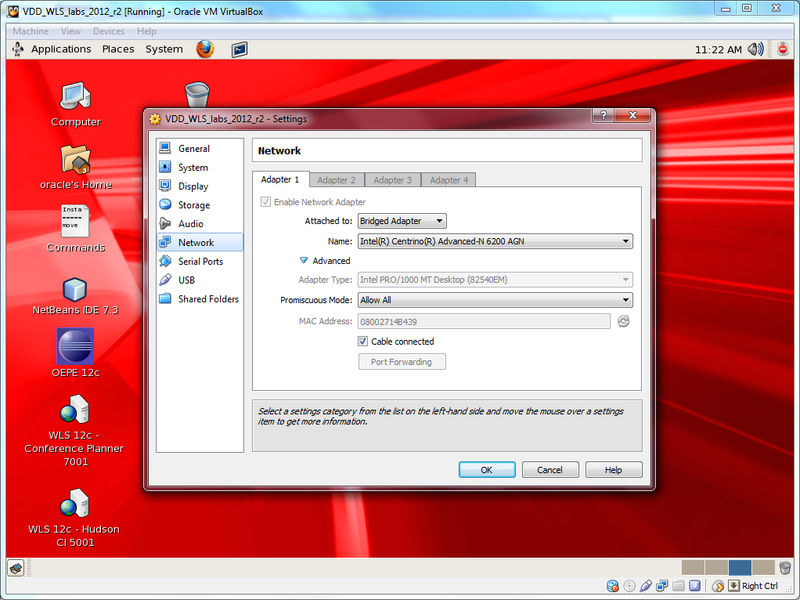 Oracle has made the installation and setup of WebLogic Server 12c on Windows, remarkably easy for us as developers. 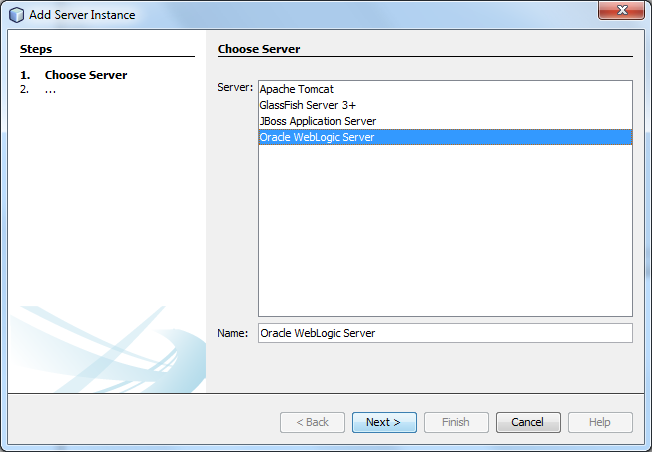 In less than a half-hour, you can install WebLogic Server, create a new WLS domain, configure the new WebLogic Server domain in NetBeans, and deploy your first application. 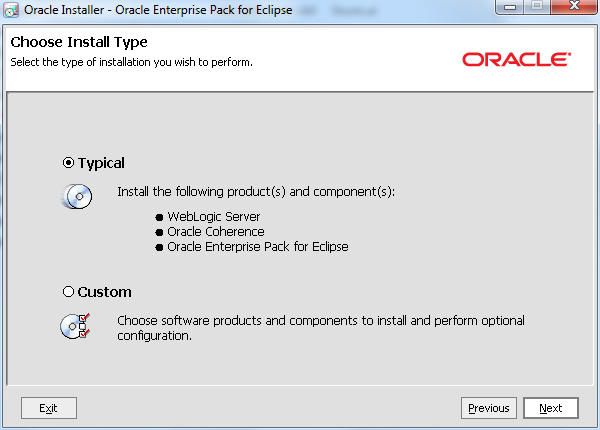 In this post, we will run through the most basic example of the install and configuration process. 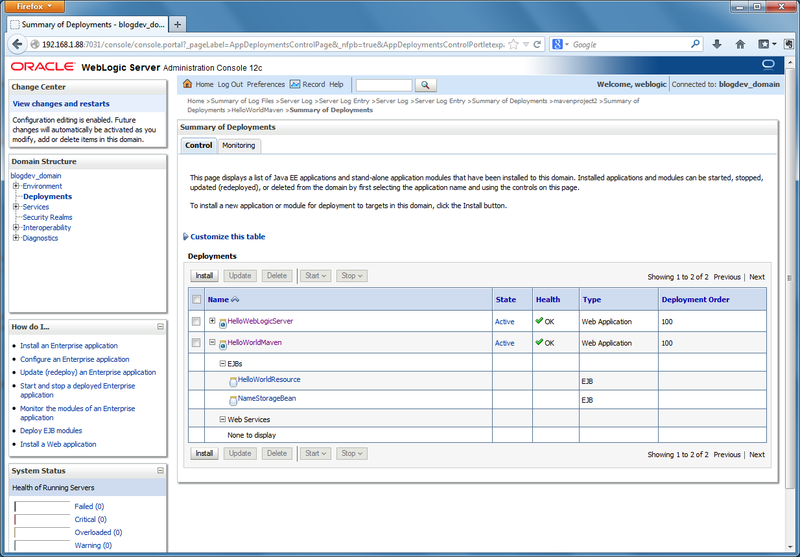 In an actual production environments, even on your development machine, you will have added considerations when deploying high-performance enterprise applications and services to WebLogic Server. 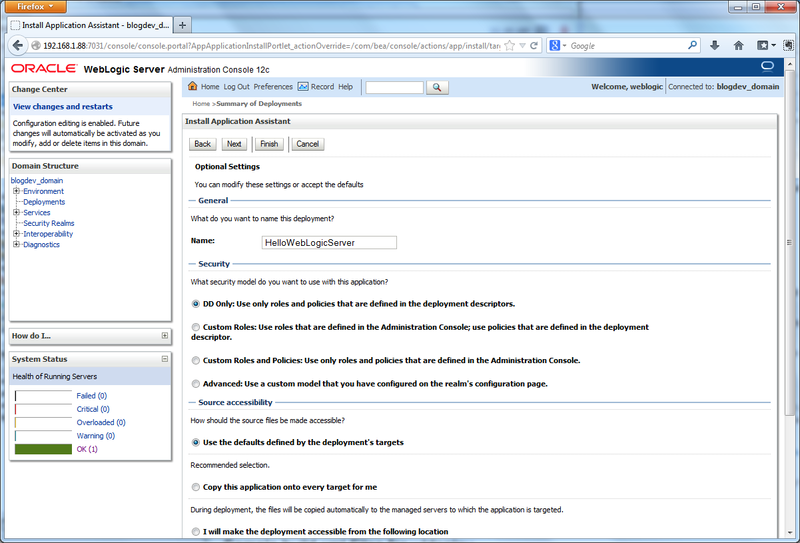 Considerations, such as security, persistence, web service configuration, performance, monitoring, and messaging, not be covered. 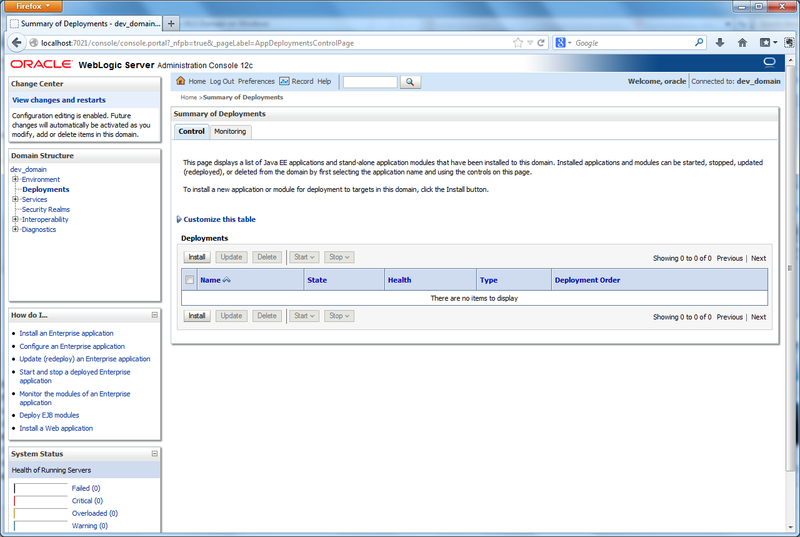 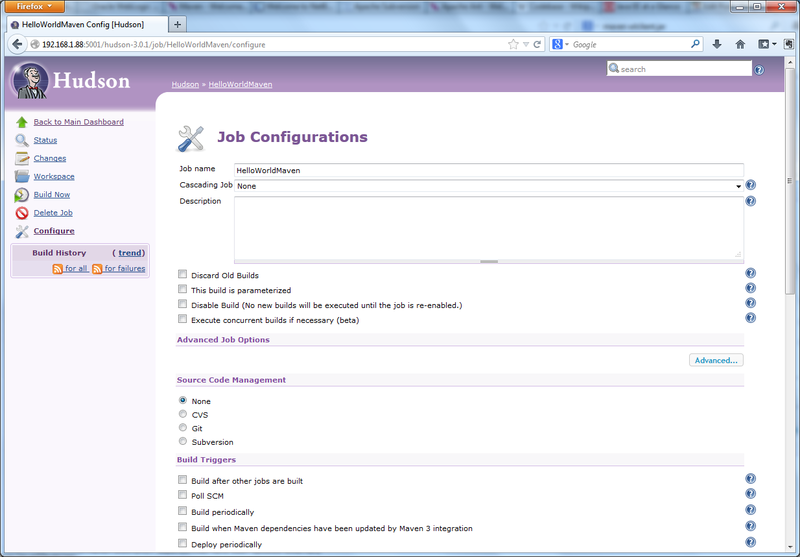 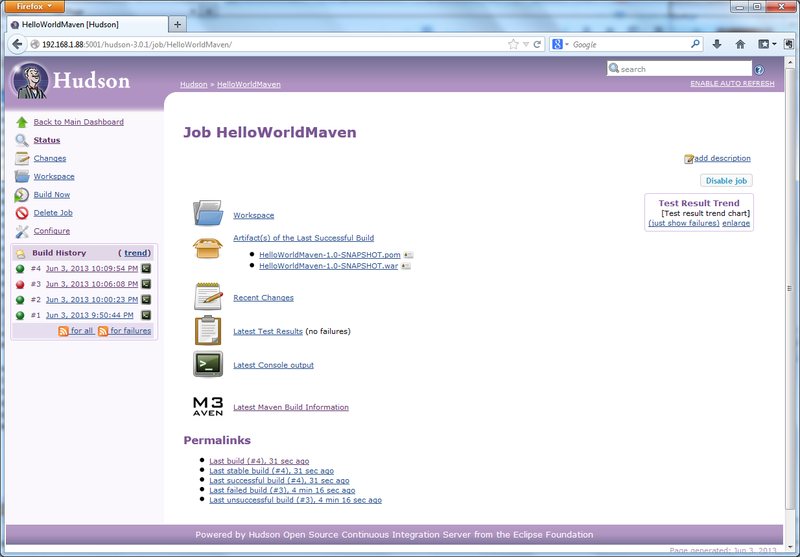 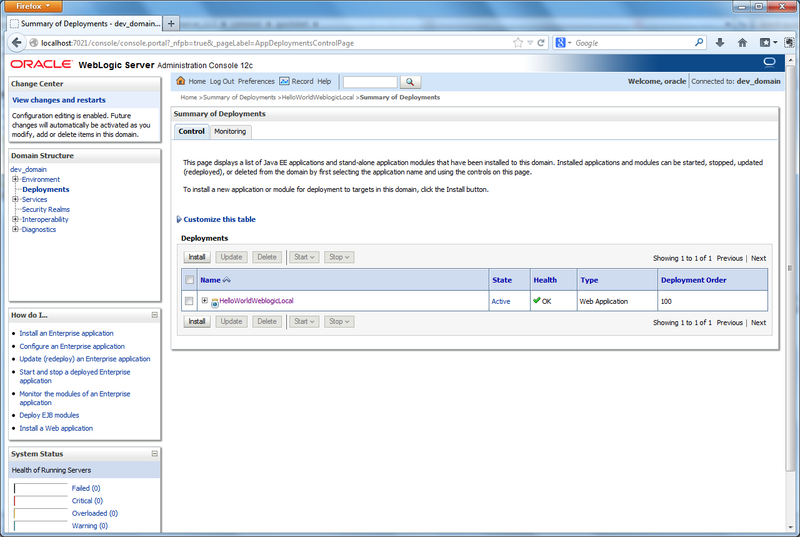 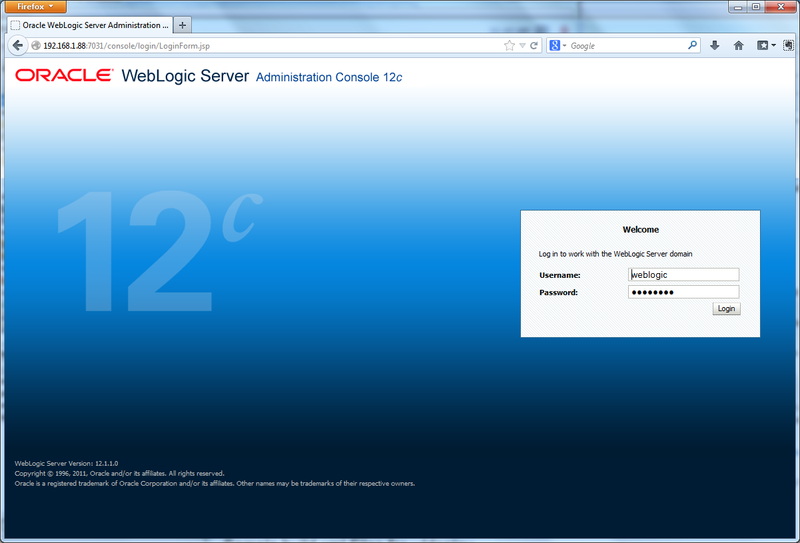 None the less, this post should show just how easy it is to get started with WebLogic Server. 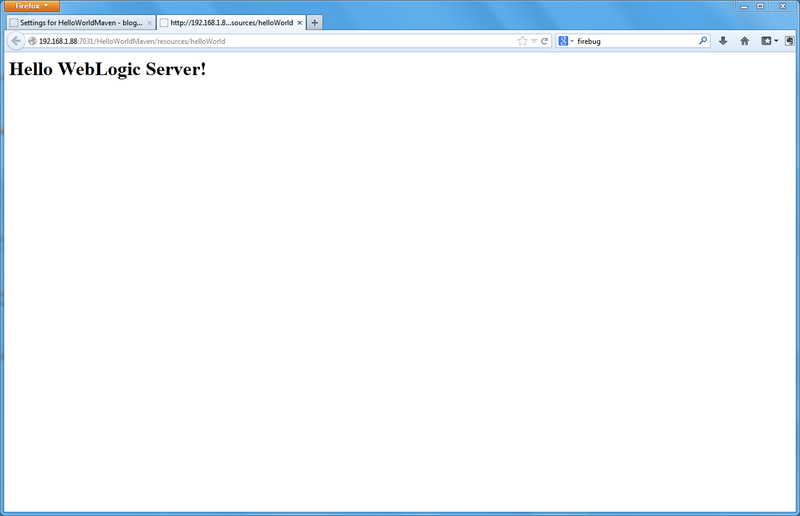 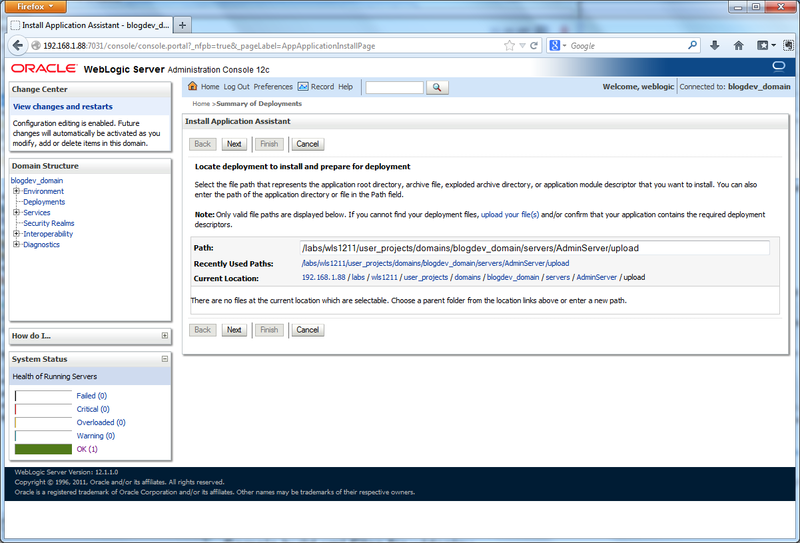 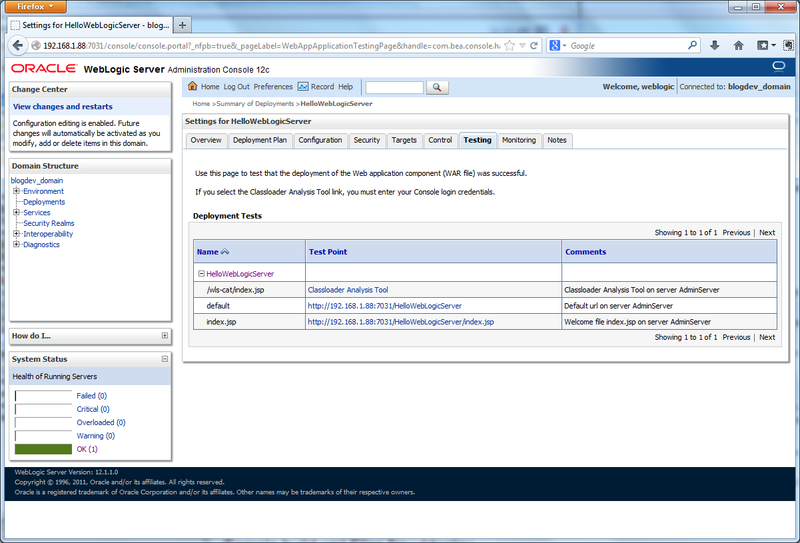 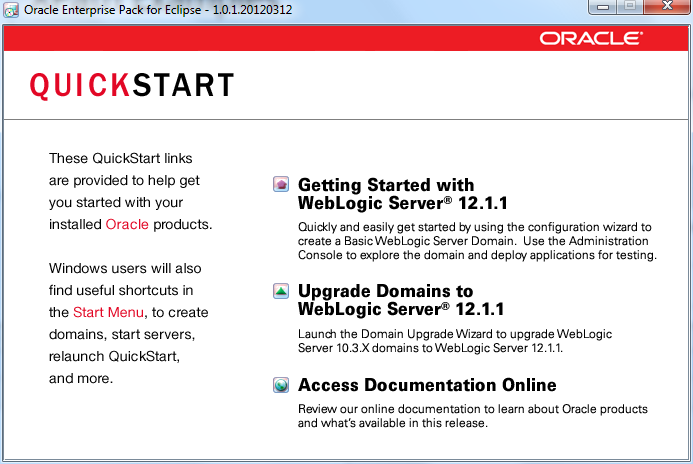 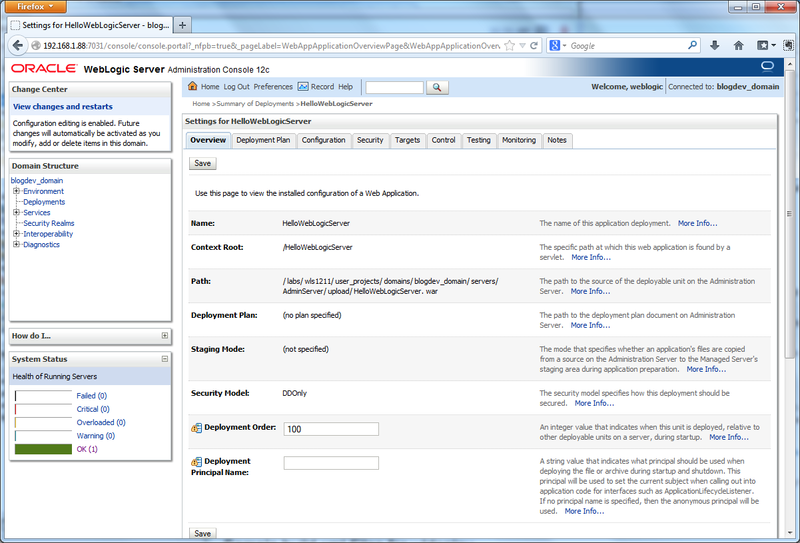 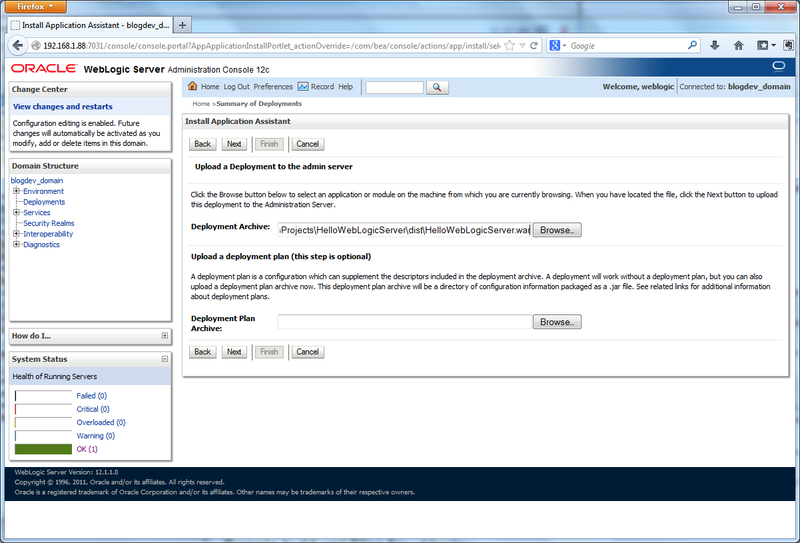 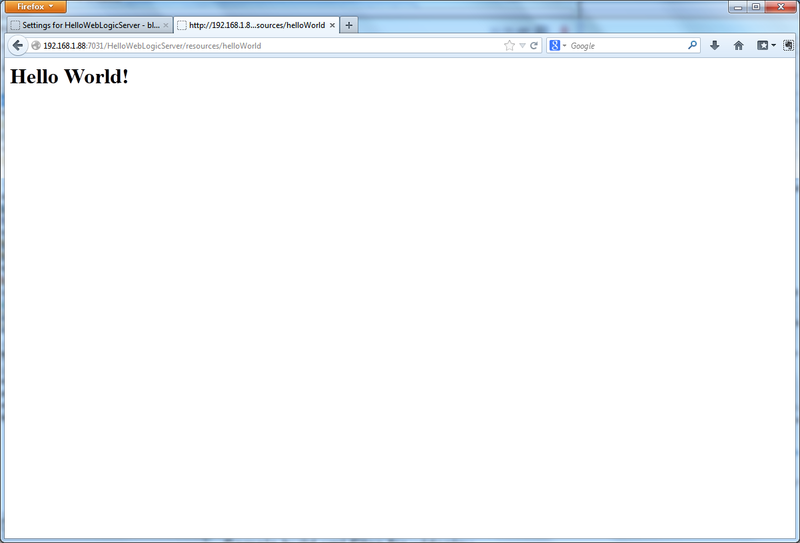 Download the latest version of WebLogic Server (WLS) from Oracle’s website. 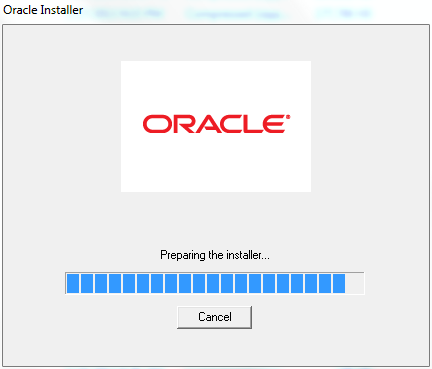 Once the rather large download is complete, double-click on the executable file to start the install process. 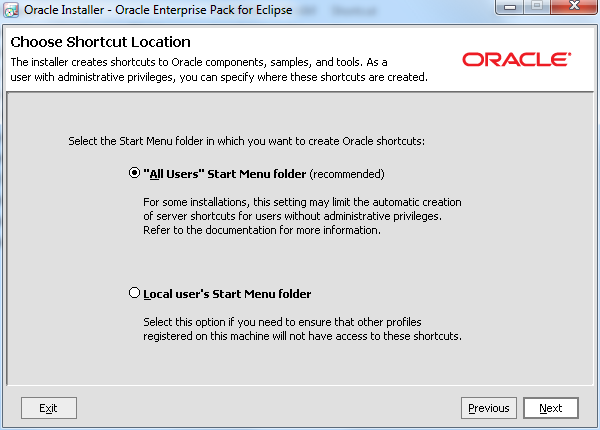 I used all the default settings during the installation, illustrated below. 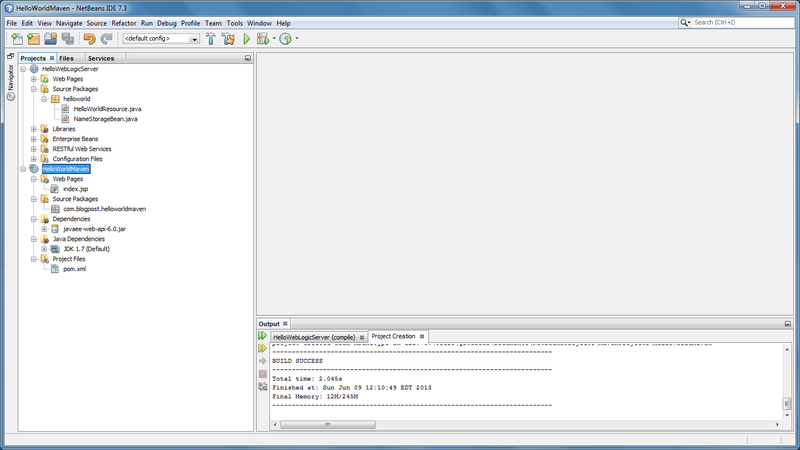 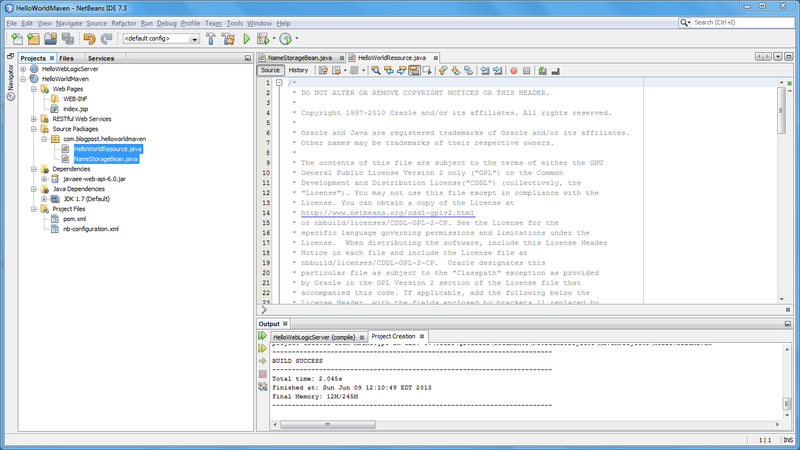 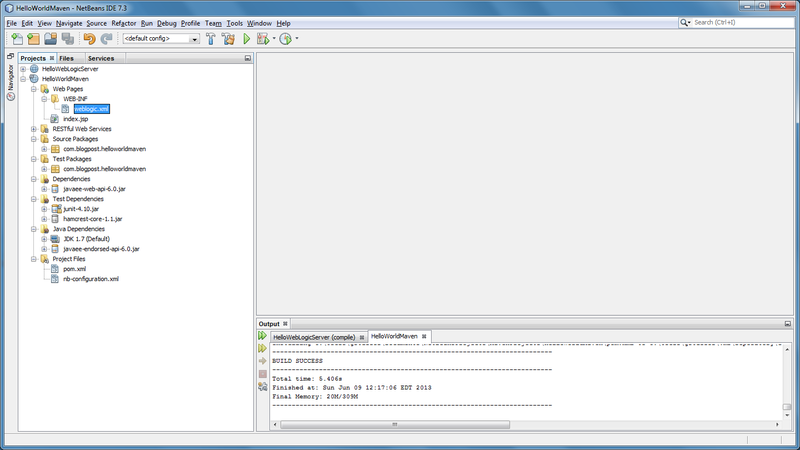 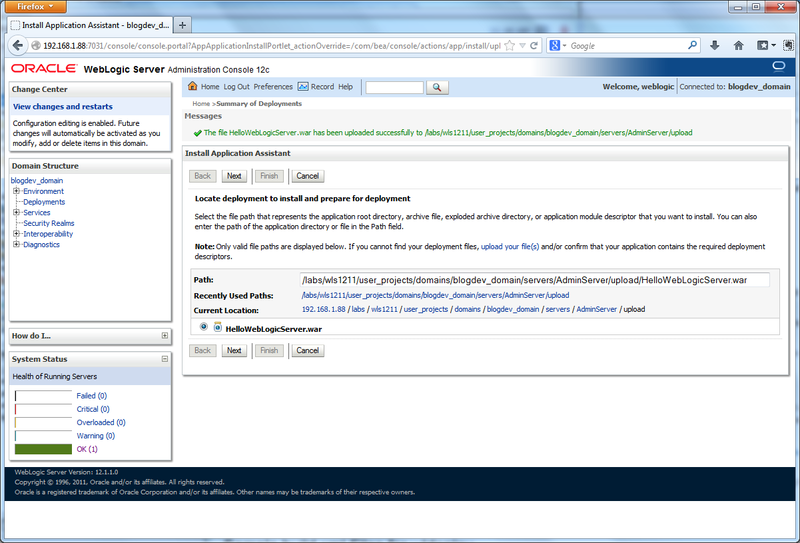 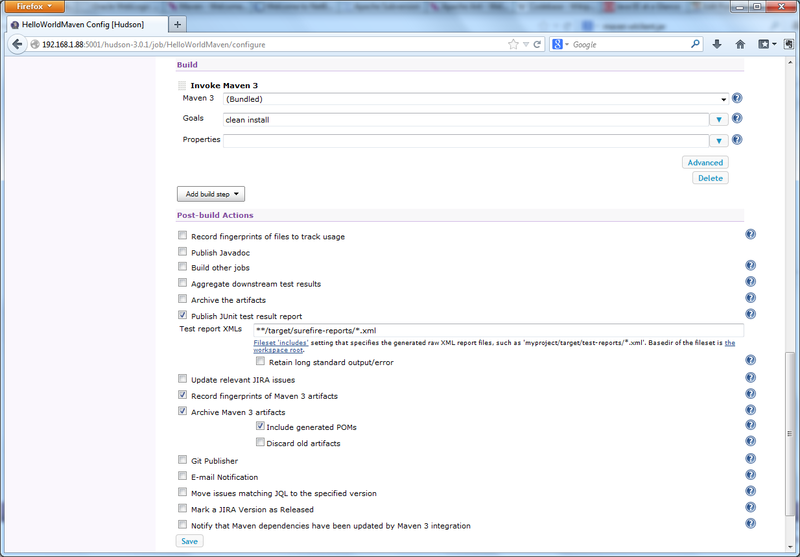 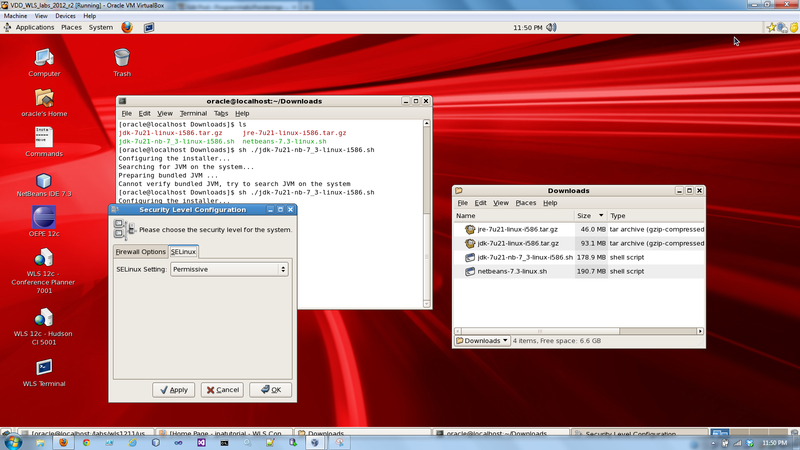 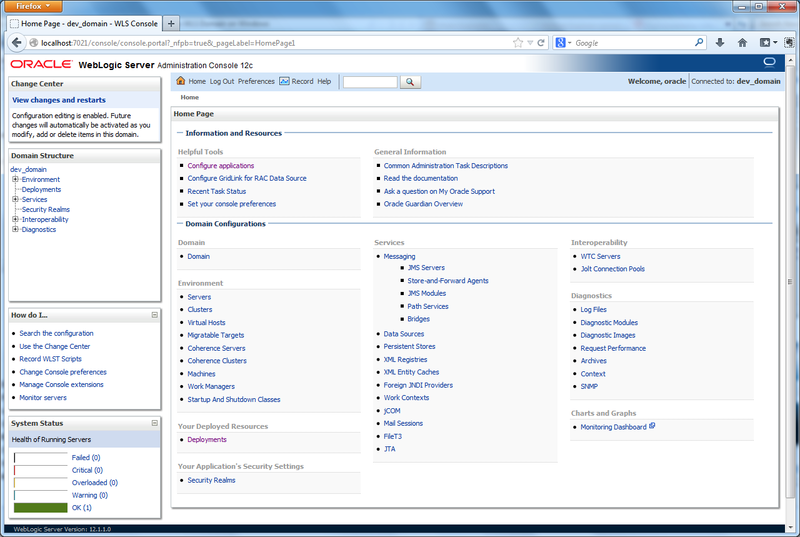 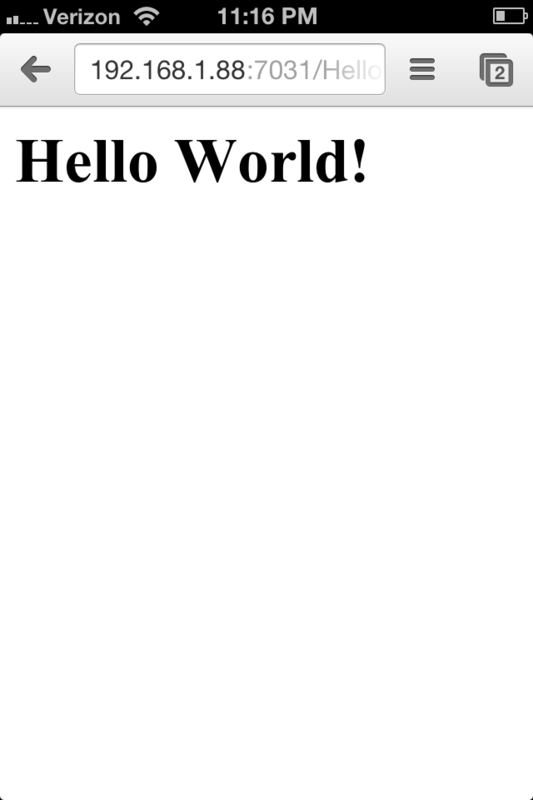 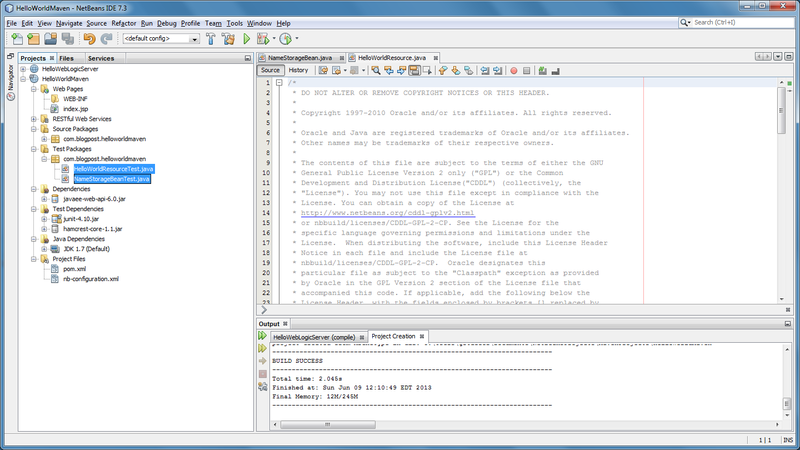 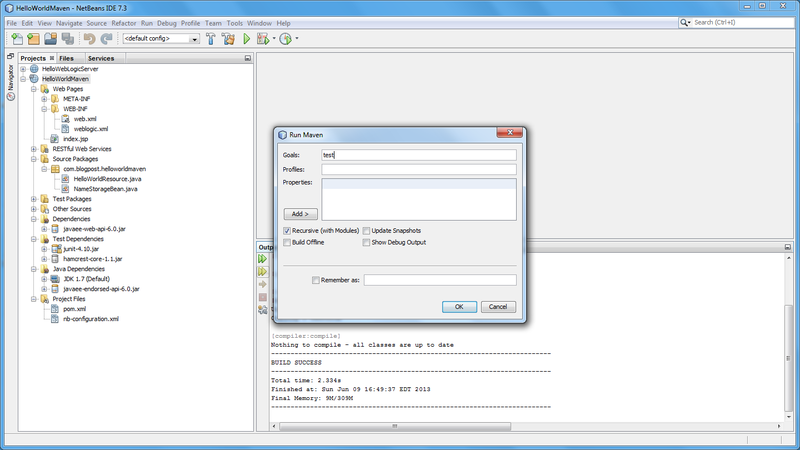 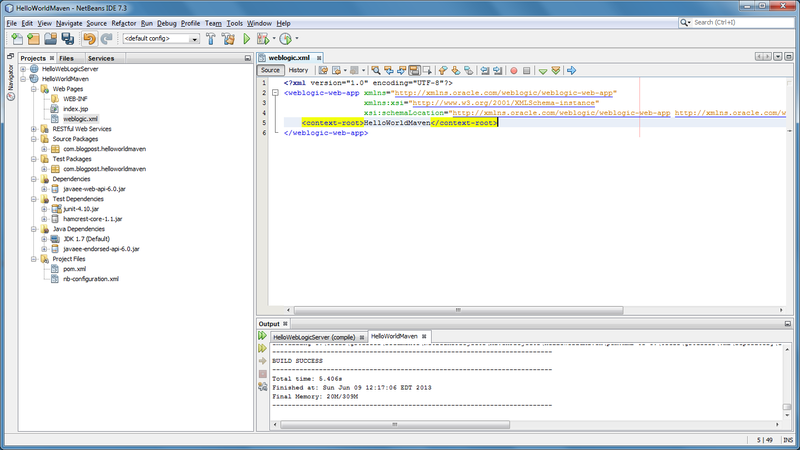 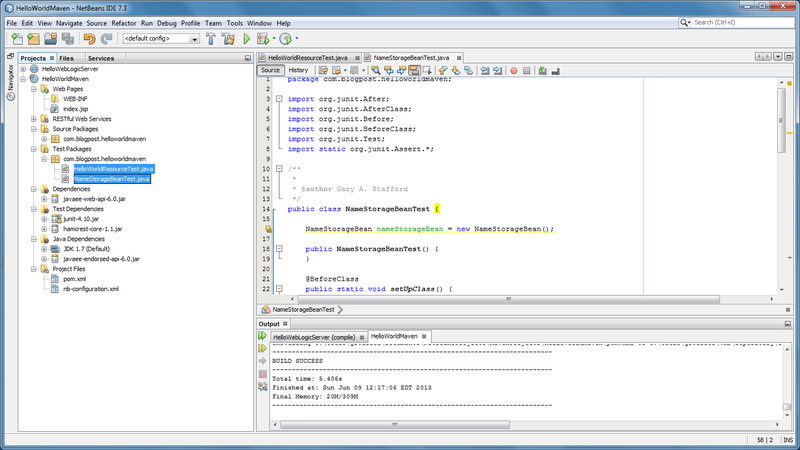 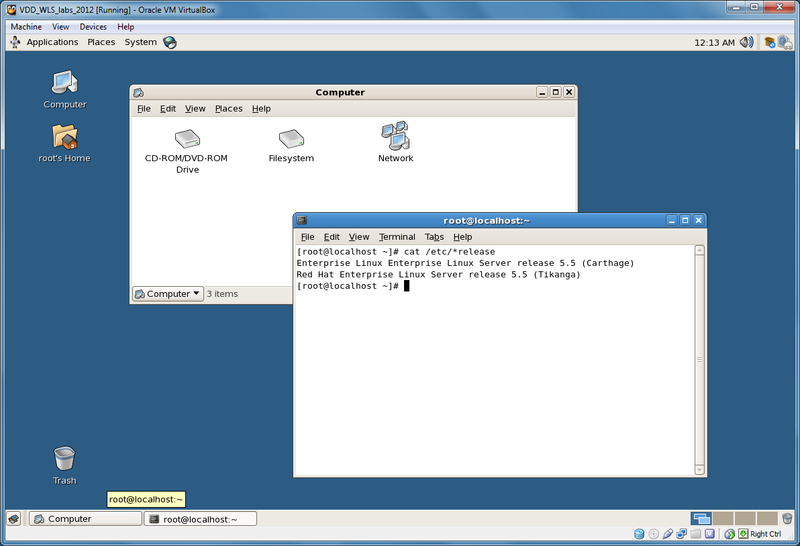 The following screen-grabs show the creation a basic domain using the Wizard, without any added feature and functionality, such as web services, messaging, or persistence. 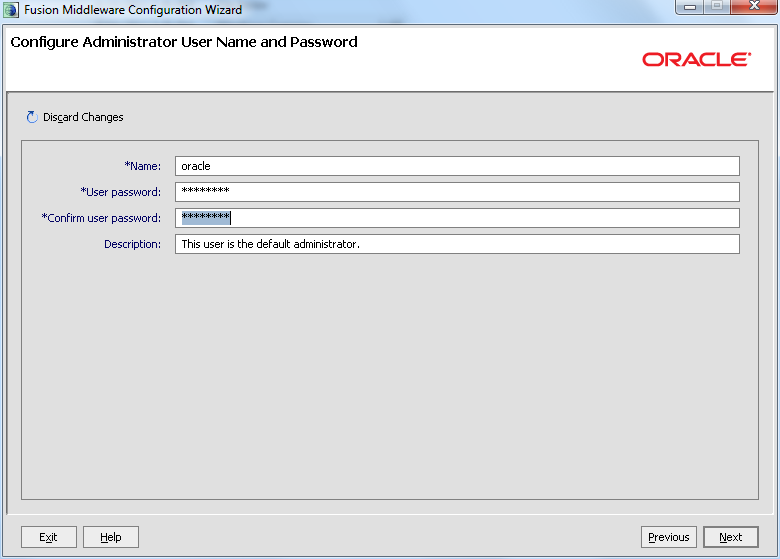 Make sure to note the username, password, and port you choose during the set-up. 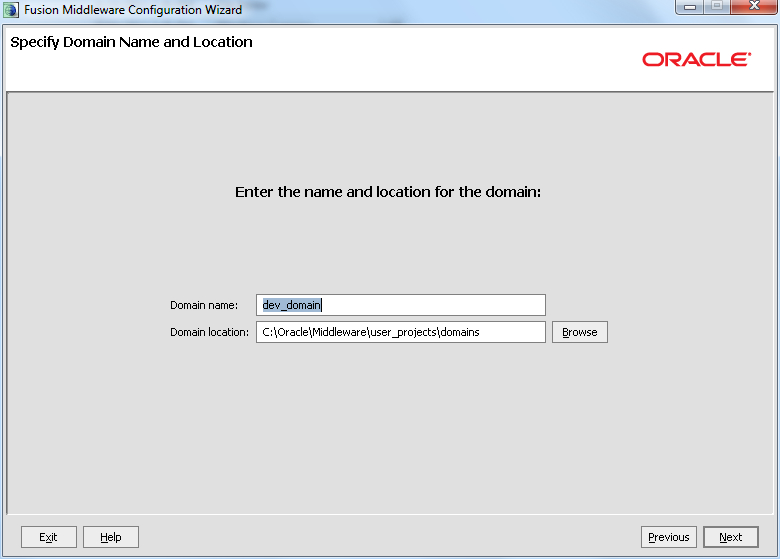 You will need them later to start the domain and to deploy to it. 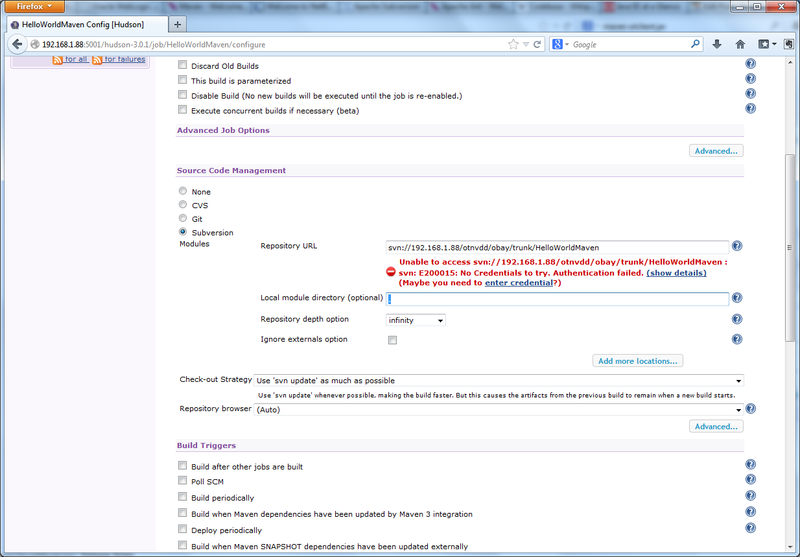 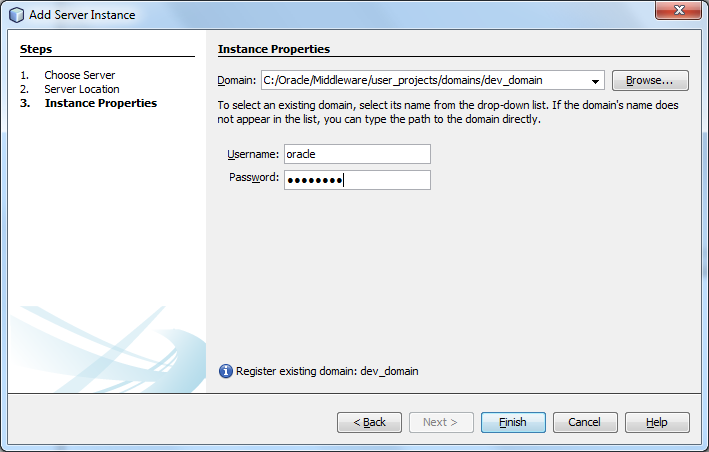 Log into WLS using the username and password you chose during the domain creation in the previous steps. 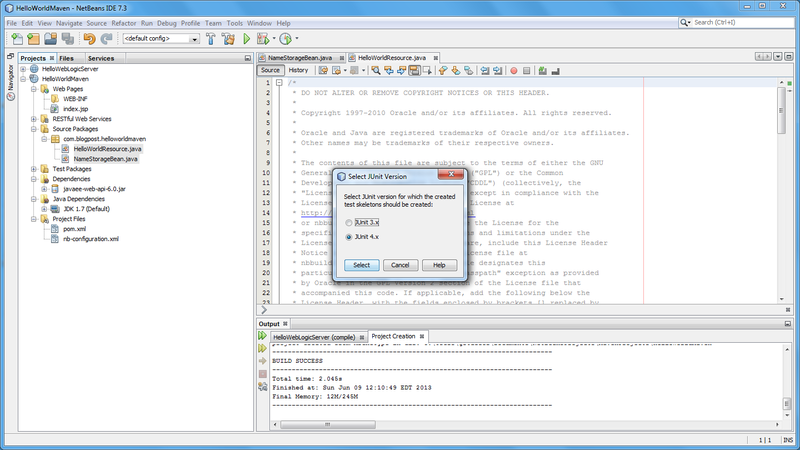 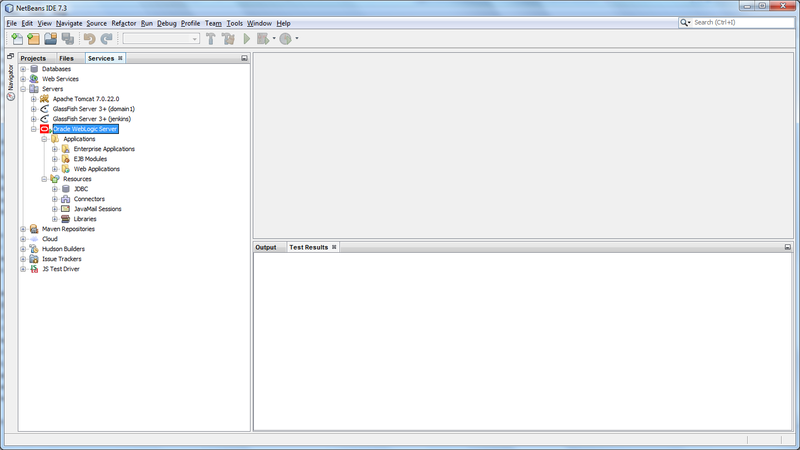 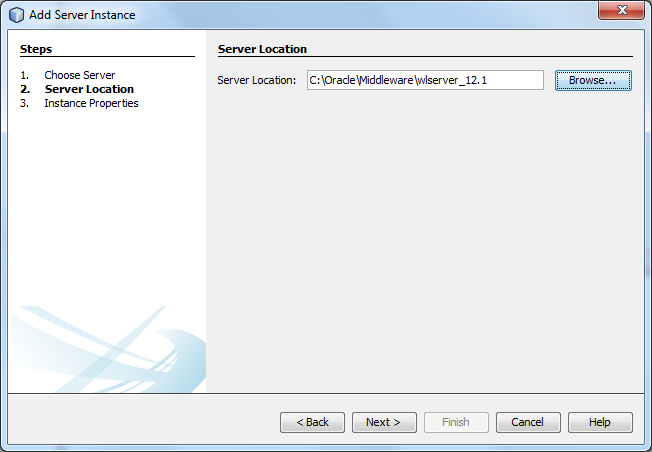 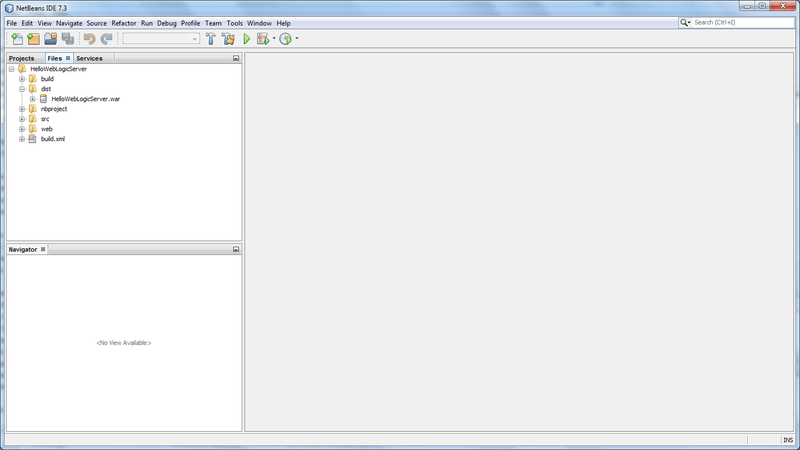 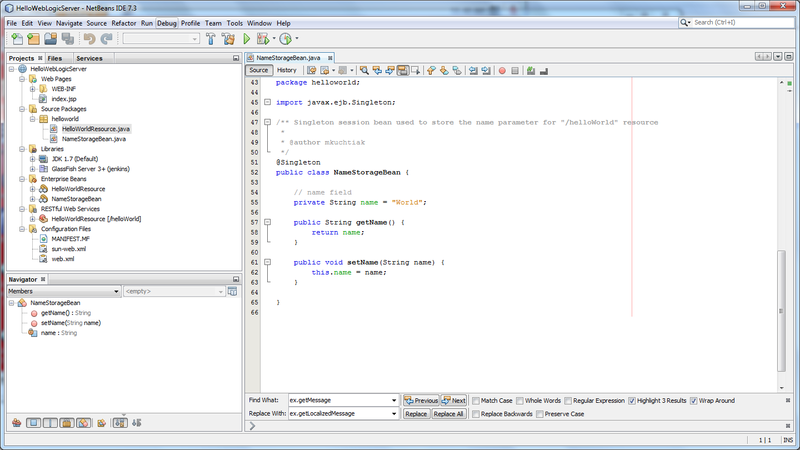 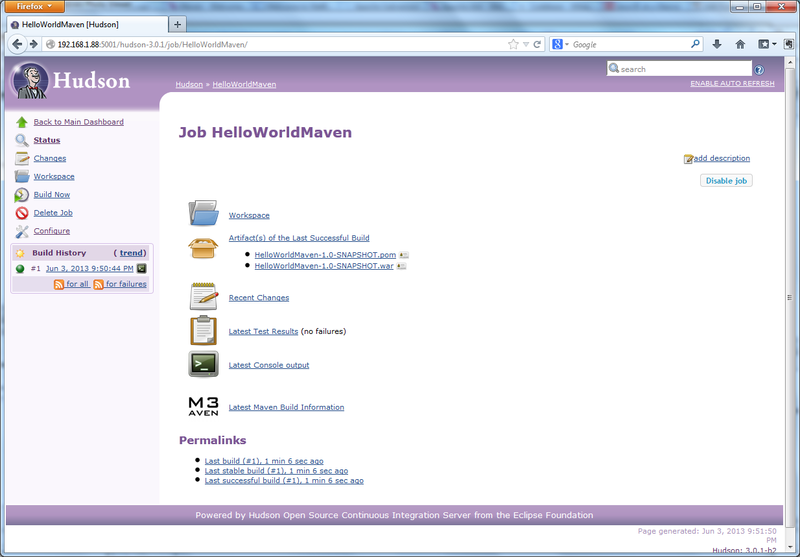 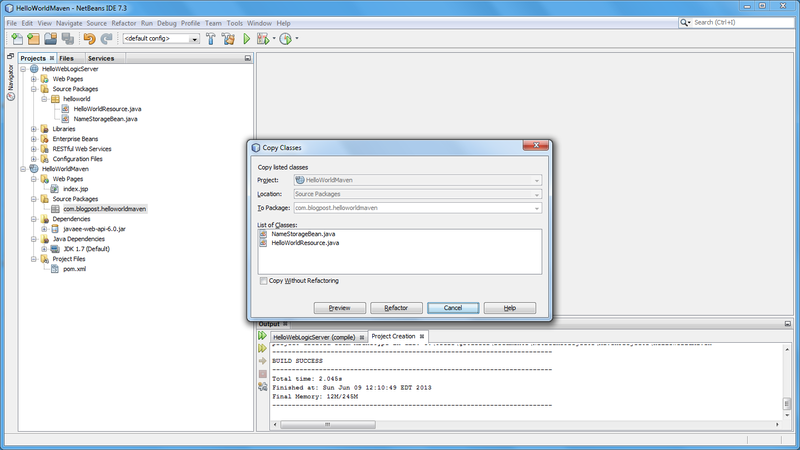 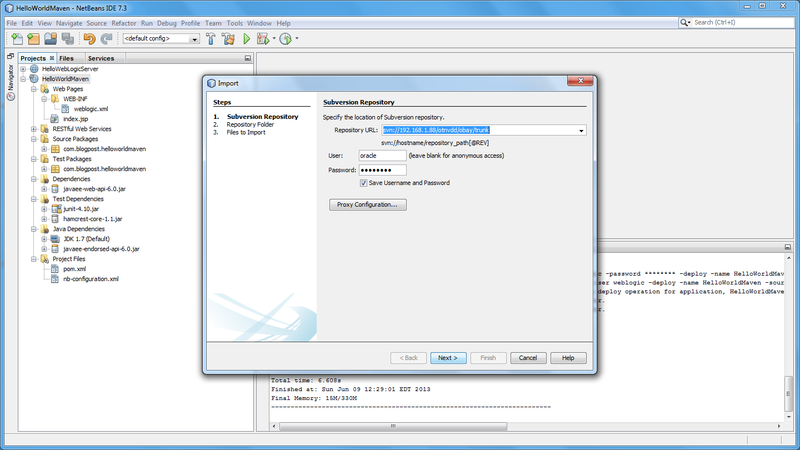 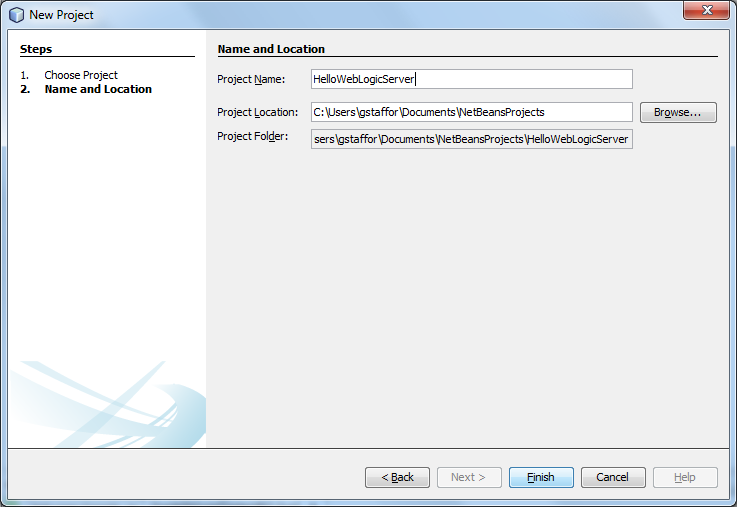 Open NetBeans and switch to the ‘Services’ Tab, right-click on ‘Server’, and select ‘Add Server…’. 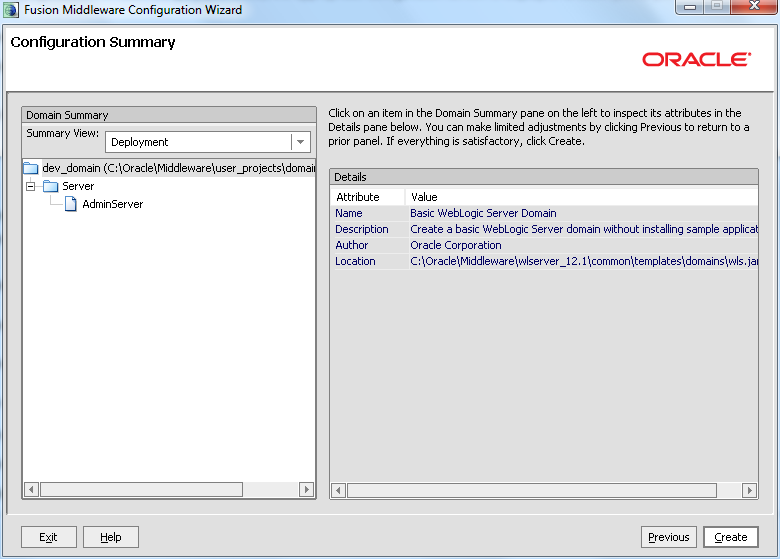 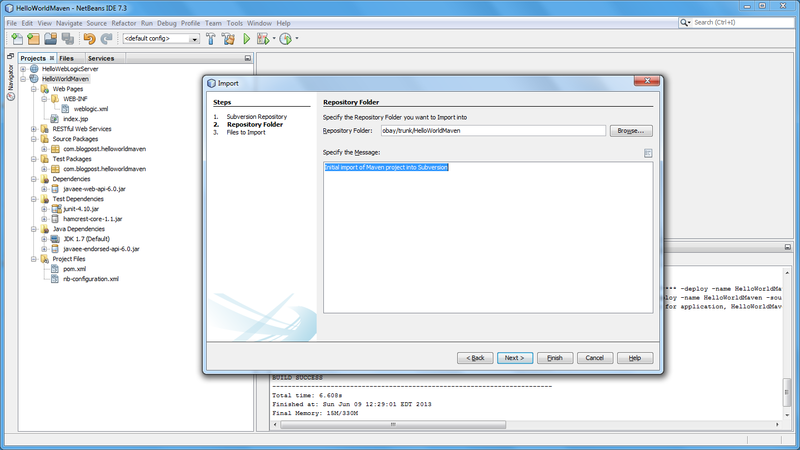 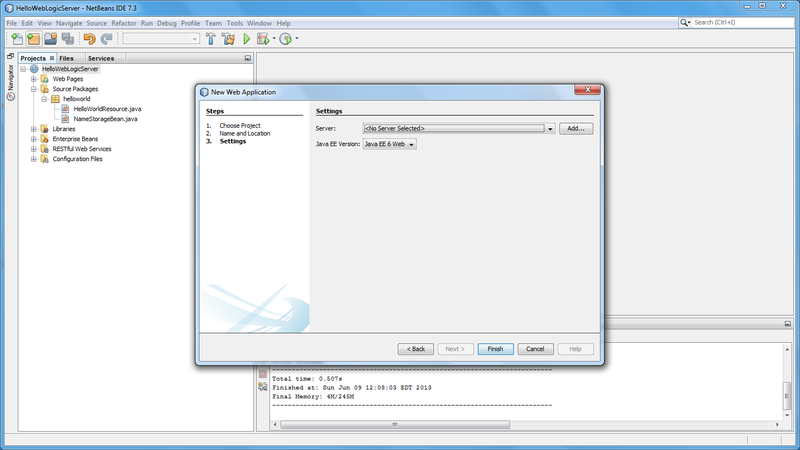 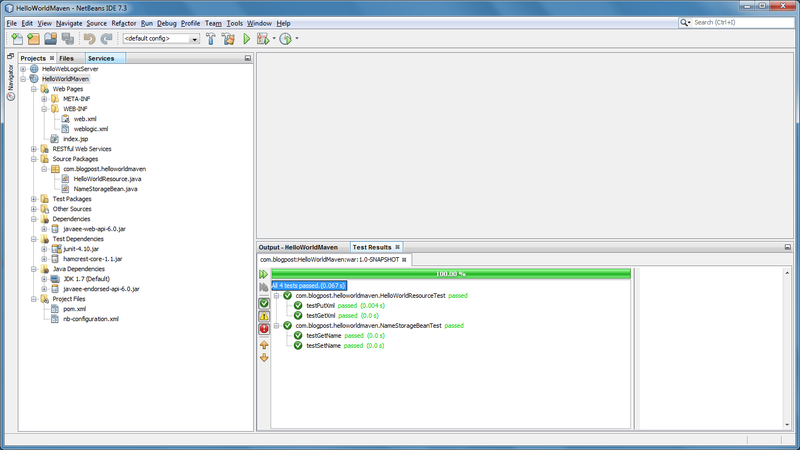 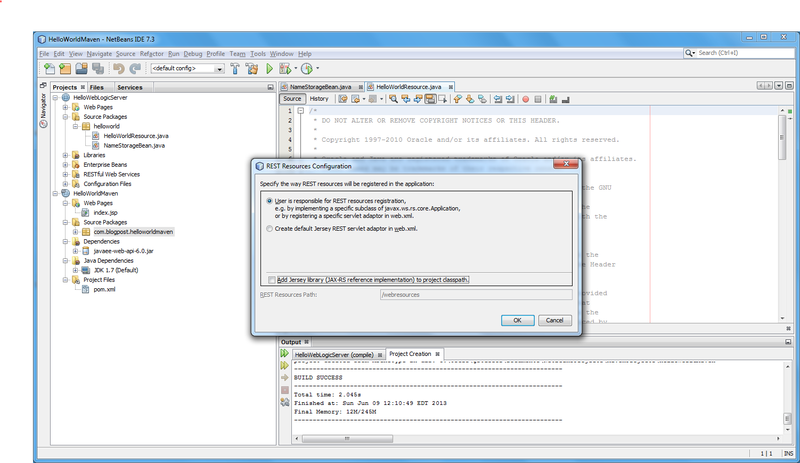 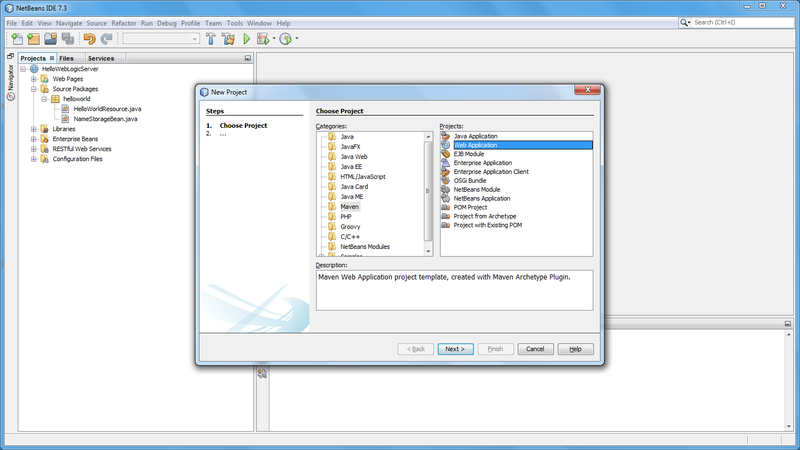 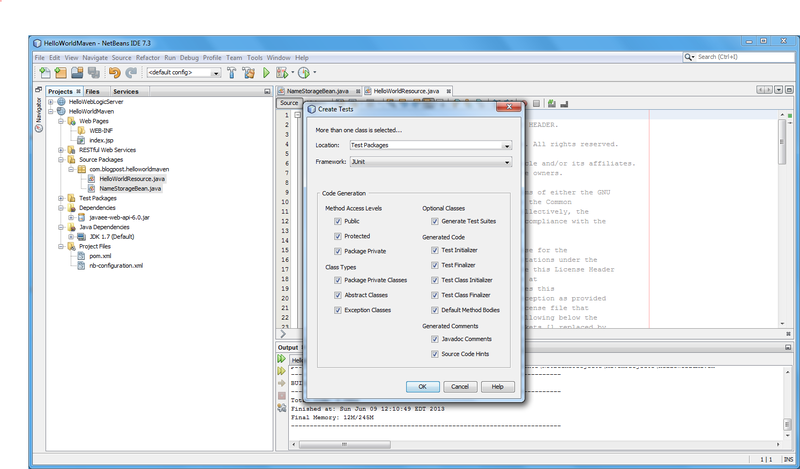 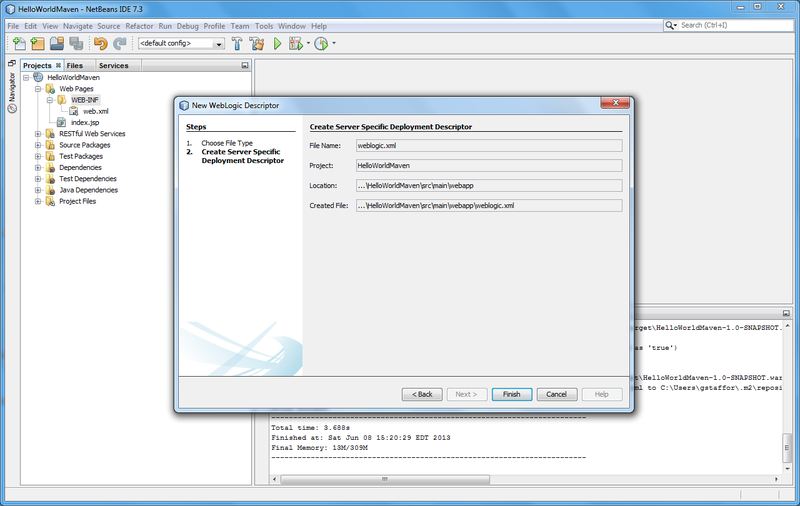 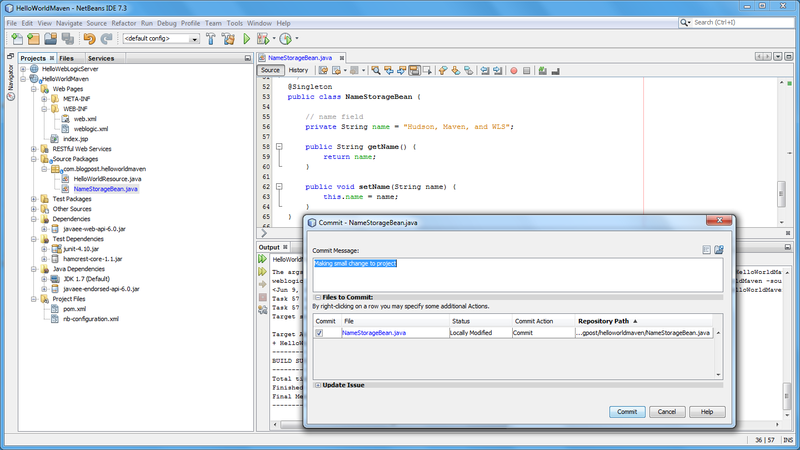 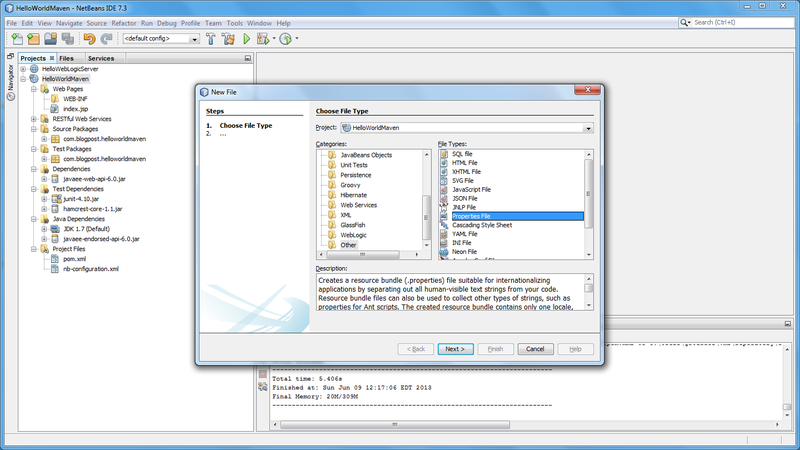 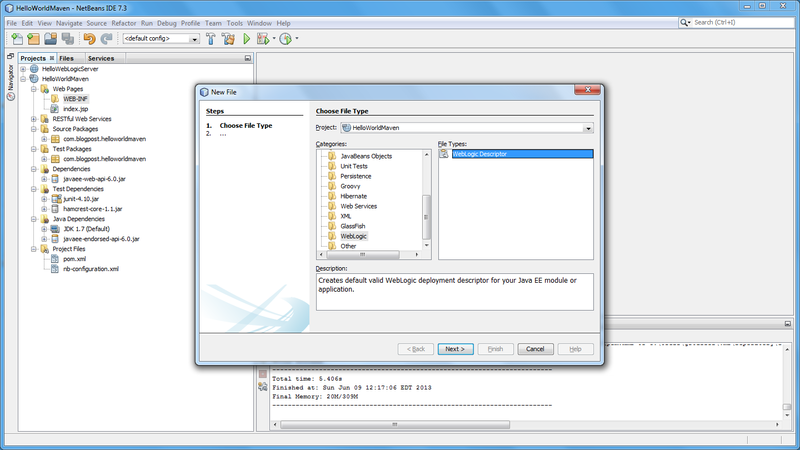 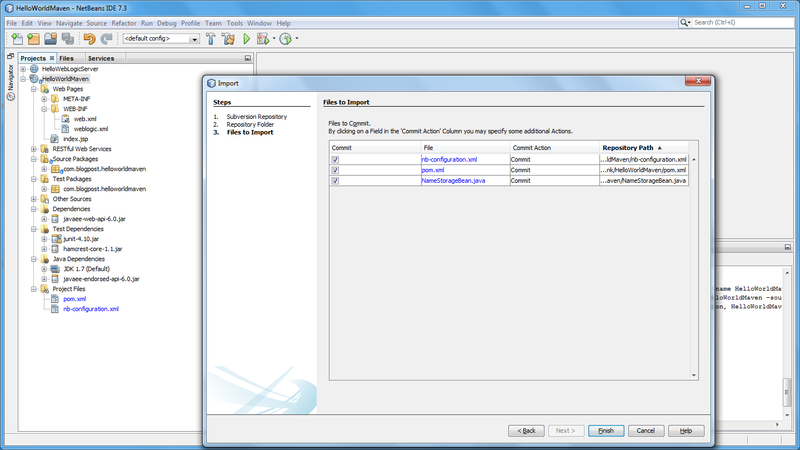 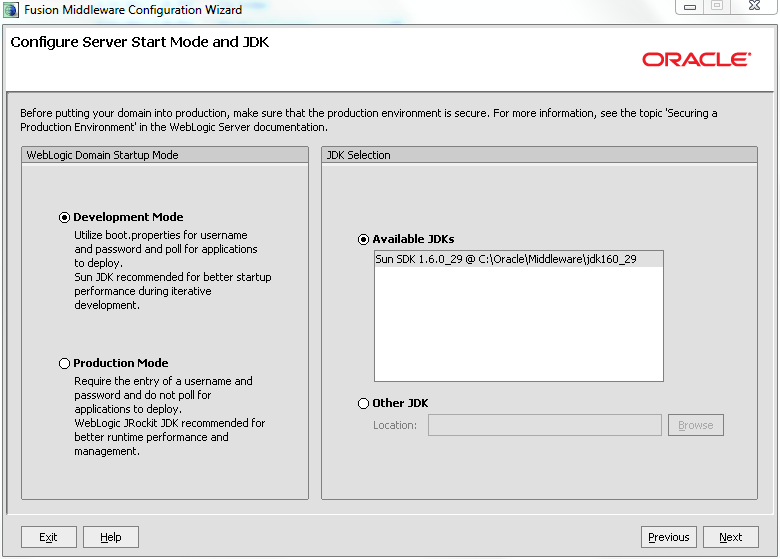 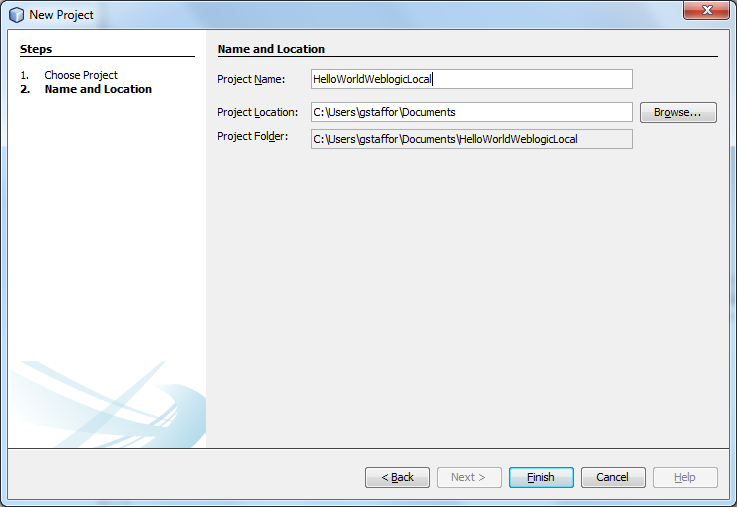 Enter the values used during the installation and domain creation steps, above. 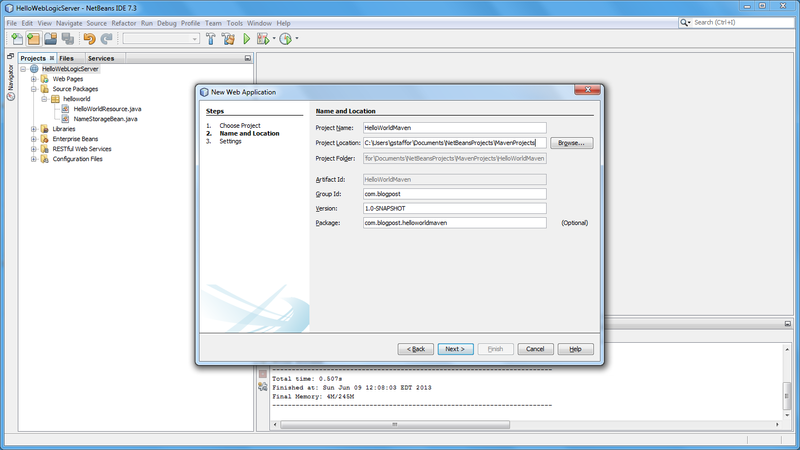 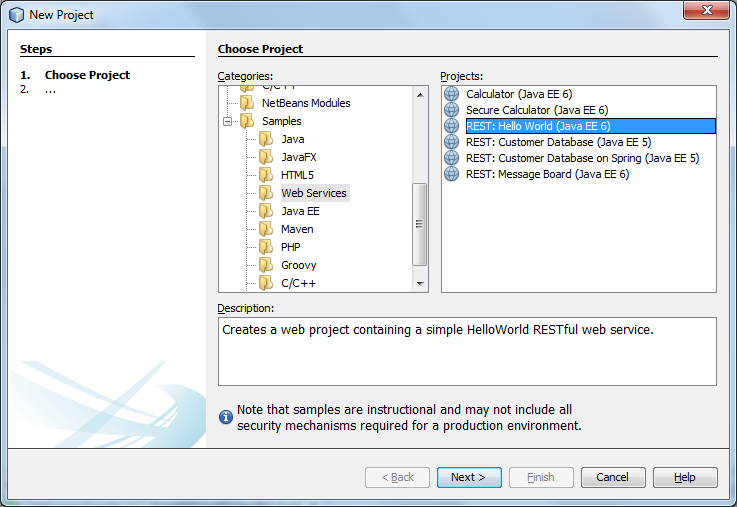 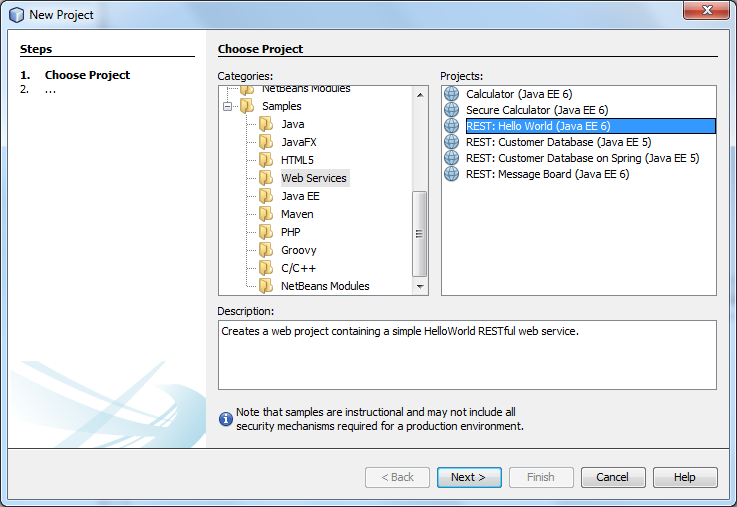 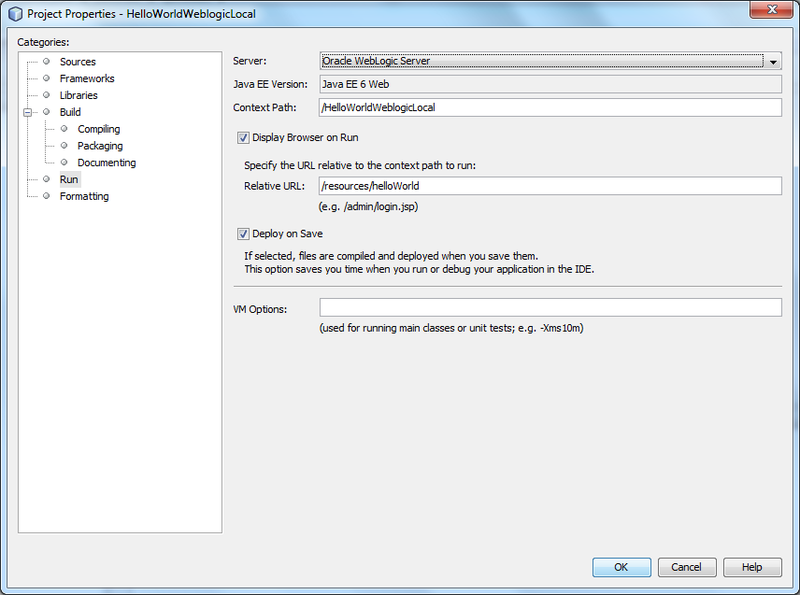 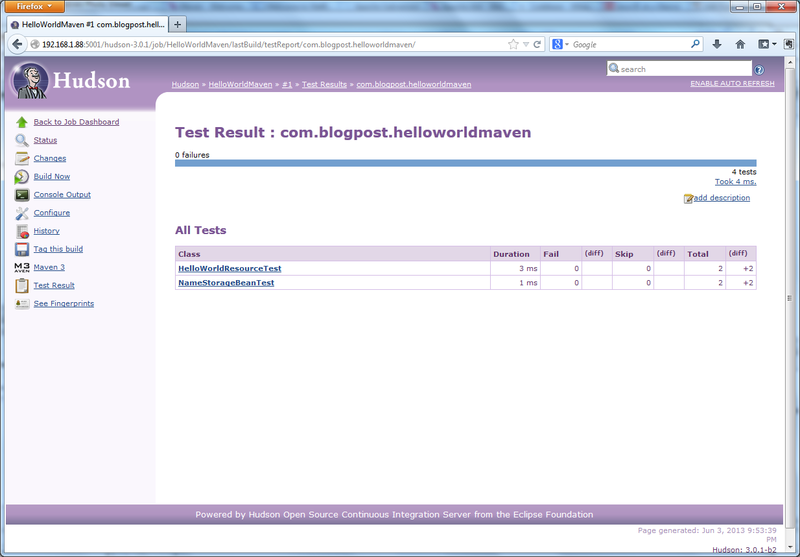 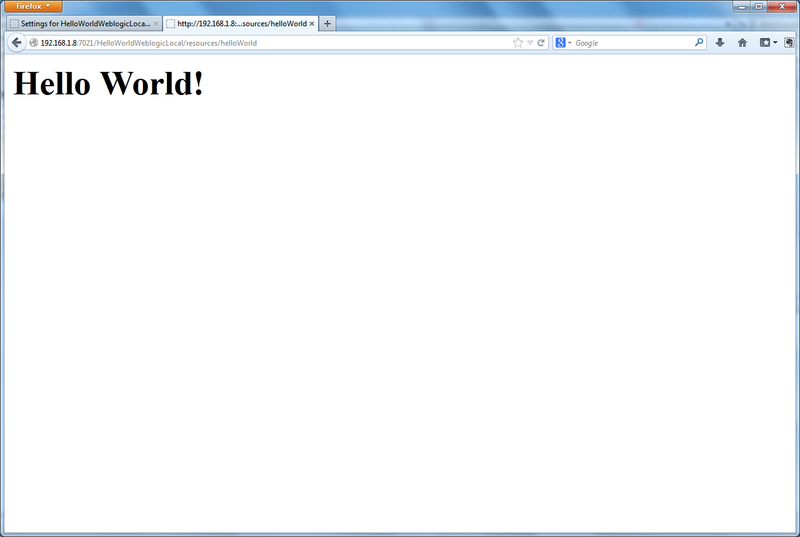 To test your new WLS domain, create a quick Java EE Hello World RESTful web service NetBeans sample project. 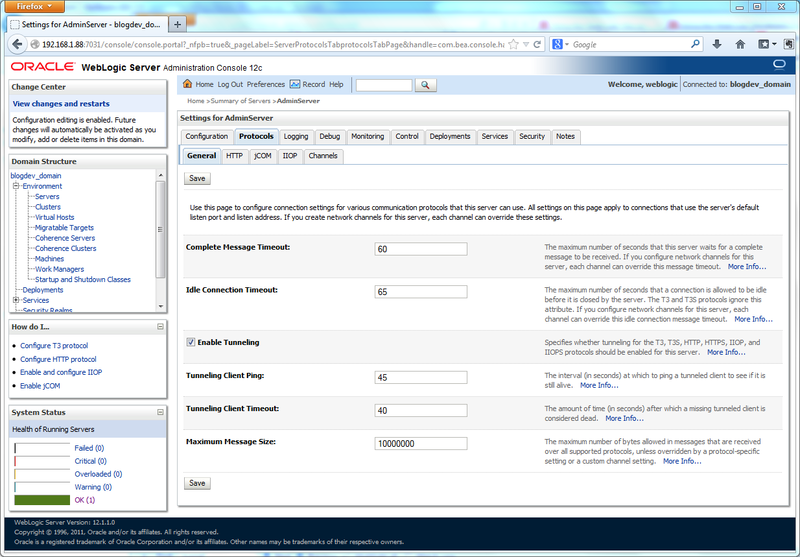 We have used this sample many times before in previous posts to demonstrate various server deployments. 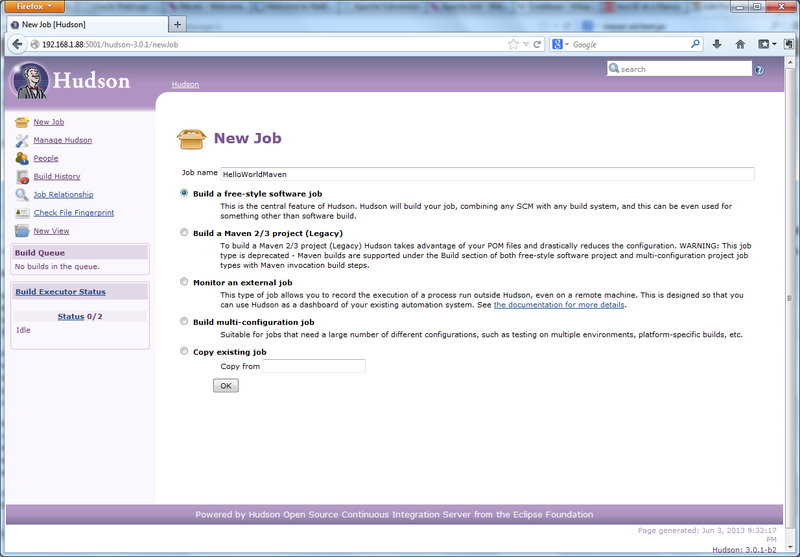 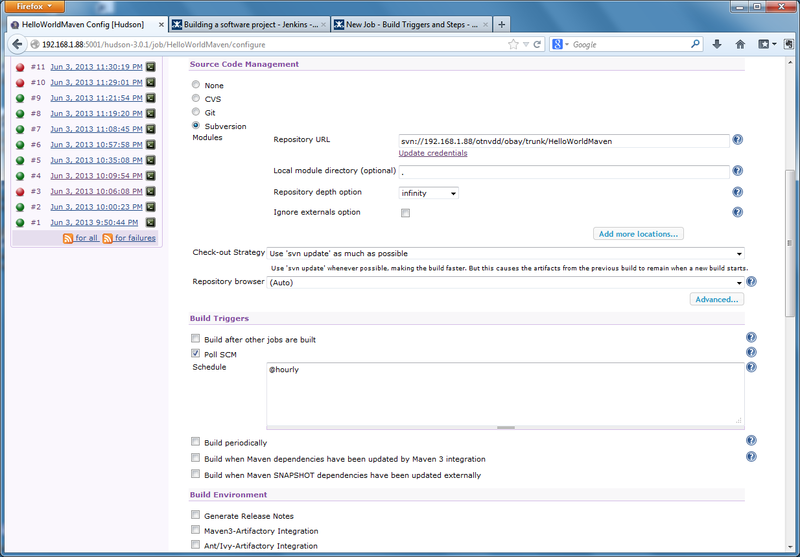 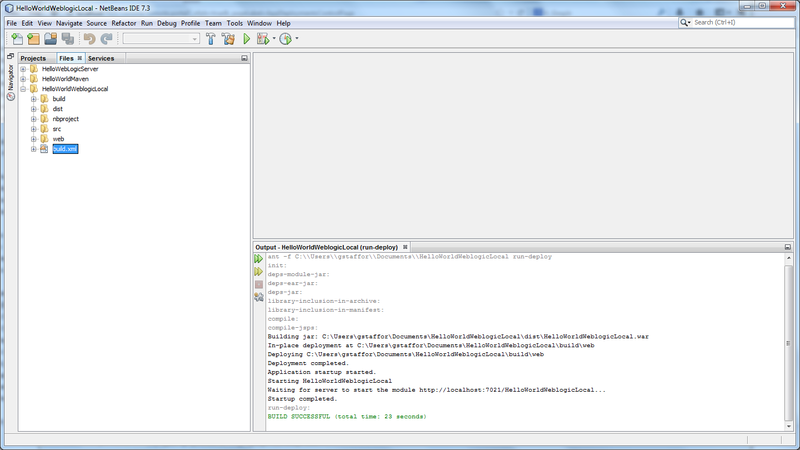 Right-click on the project, and select ‘Properties’, and then select the ‘Build’ -> ‘Run’ menu item. 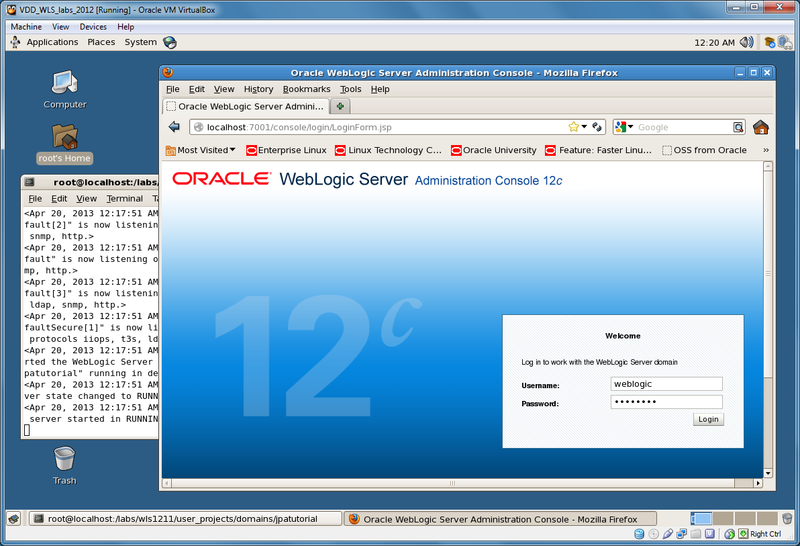 Change the Server to ‘Oracle WebLogic Server’. 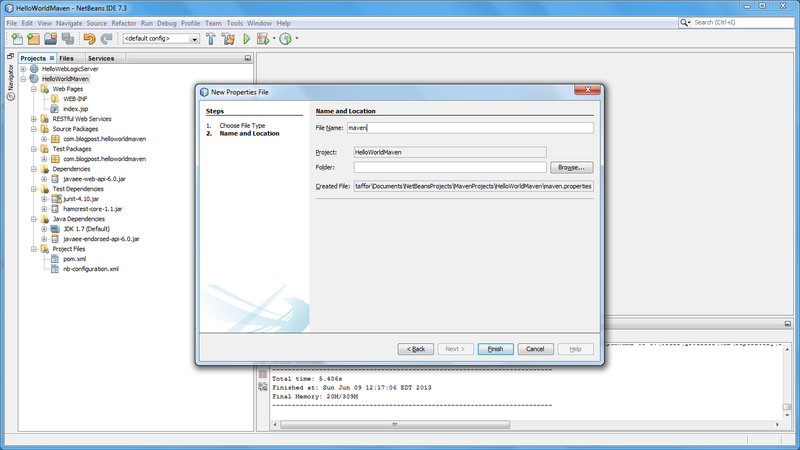 Leave all the other options with their default values. 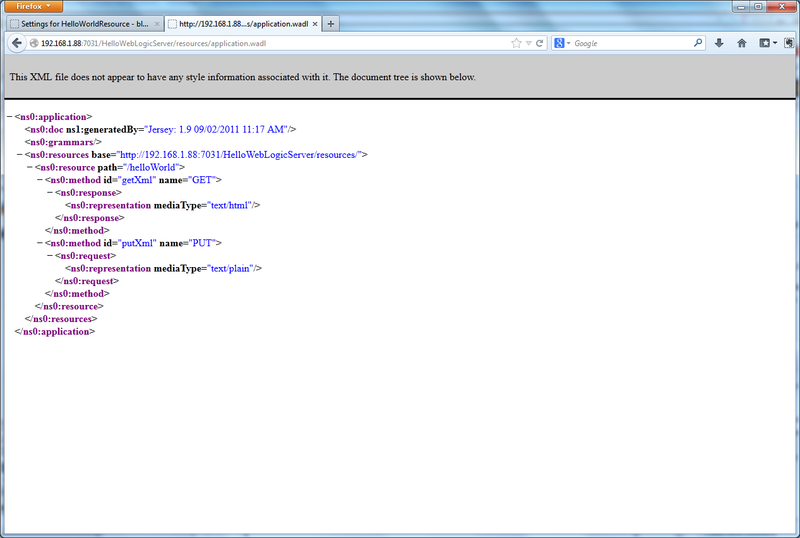 Right click on the Apache Ant ‘build.xml’ file on the ‘Files’ tab. 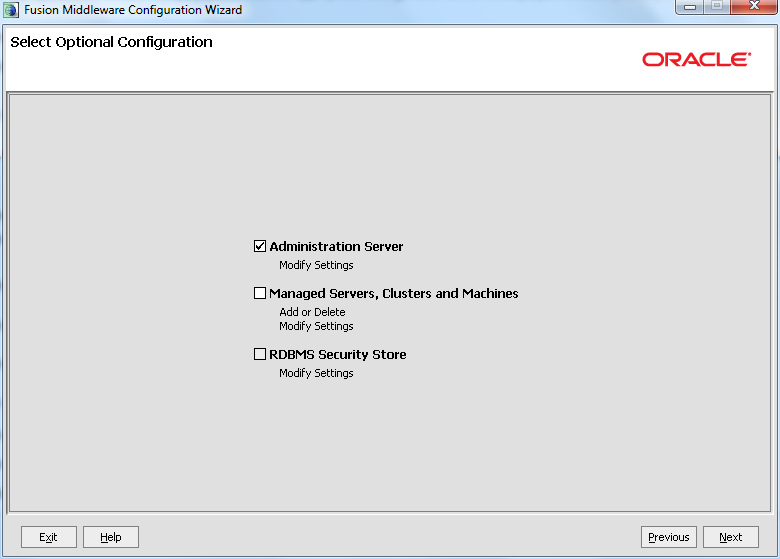 Select ‘Run Target’ -> ‘Other Targets’ -> ‘run-deploy’. 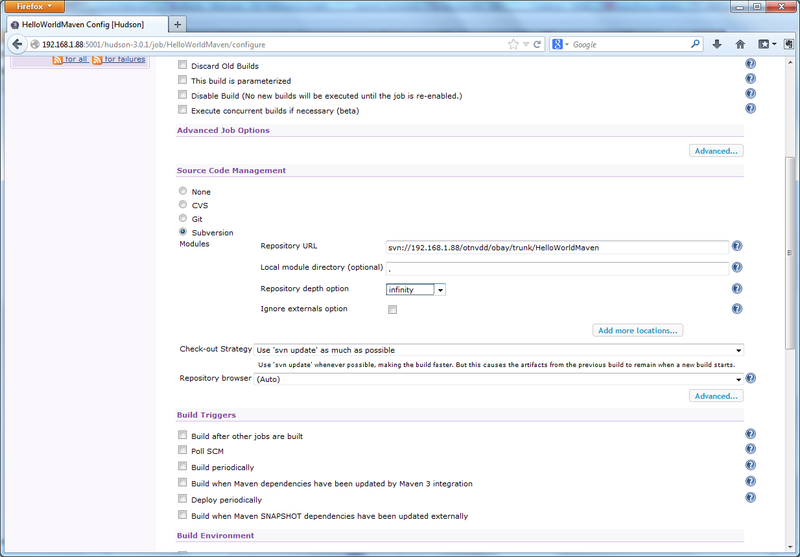 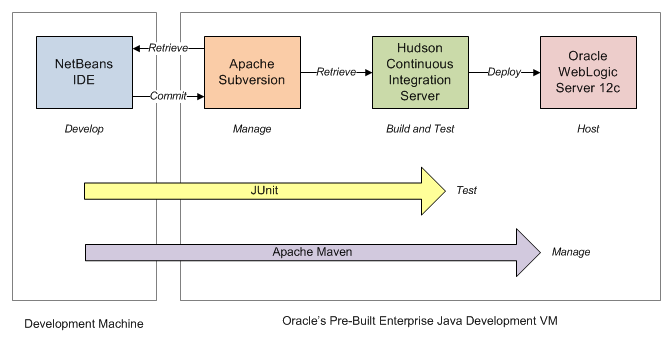 Apache Ant will run the run-deploy target, which will run a series of dependent targets. 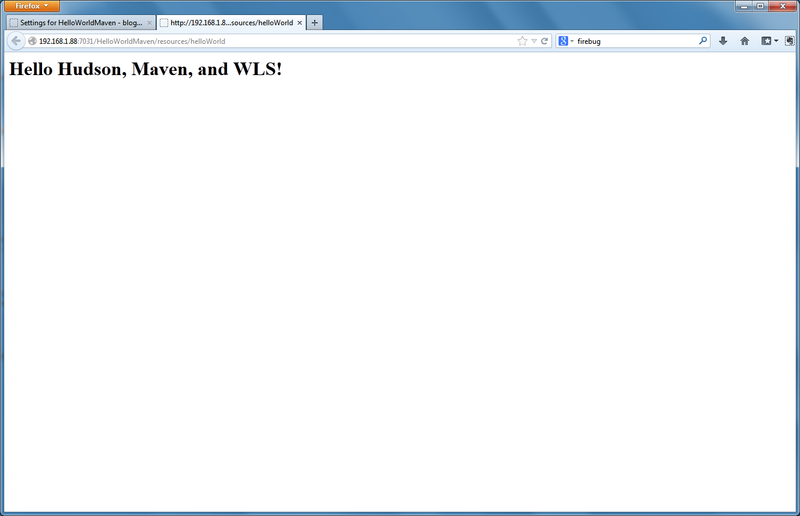 They will compile the project, build the .war file, and deploy the .war to the newly created WLS domain. 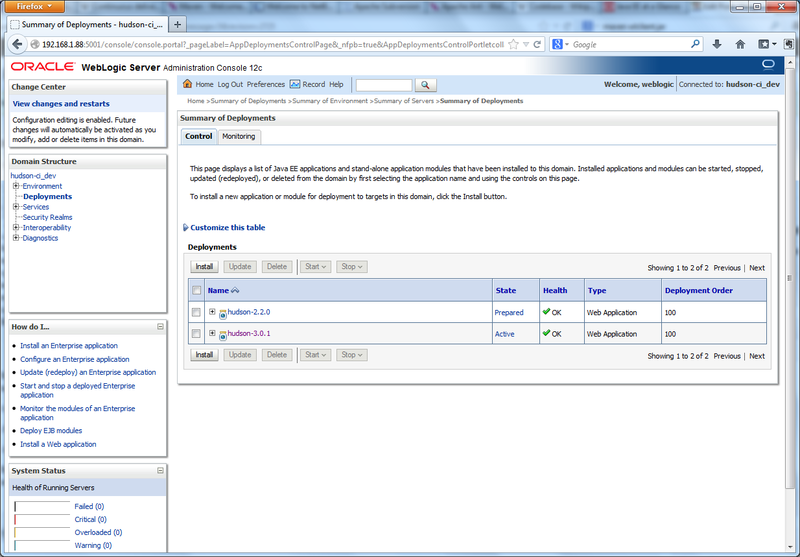 Since we did not configure any additional server within the domain, the project will be deployed to the existing ‘AdminServer’ server. 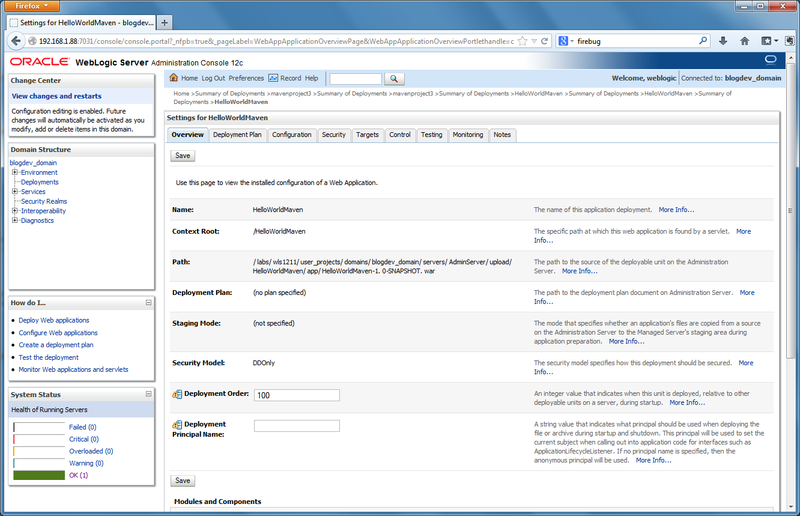 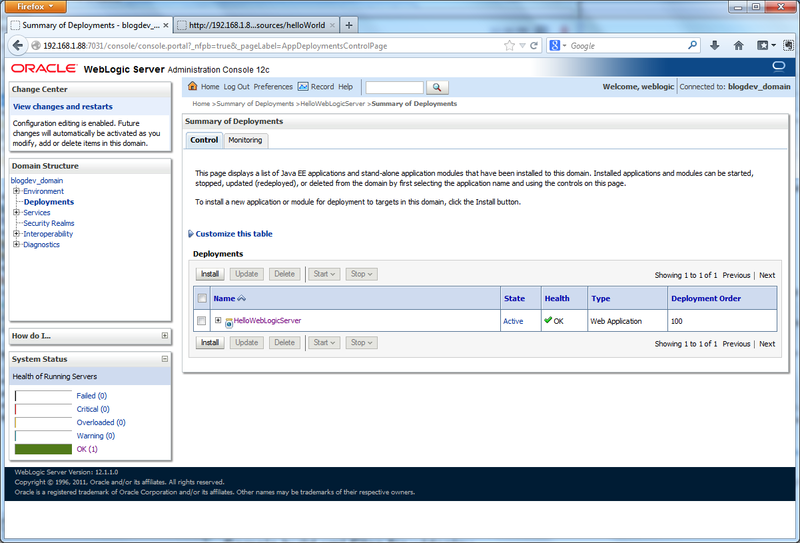 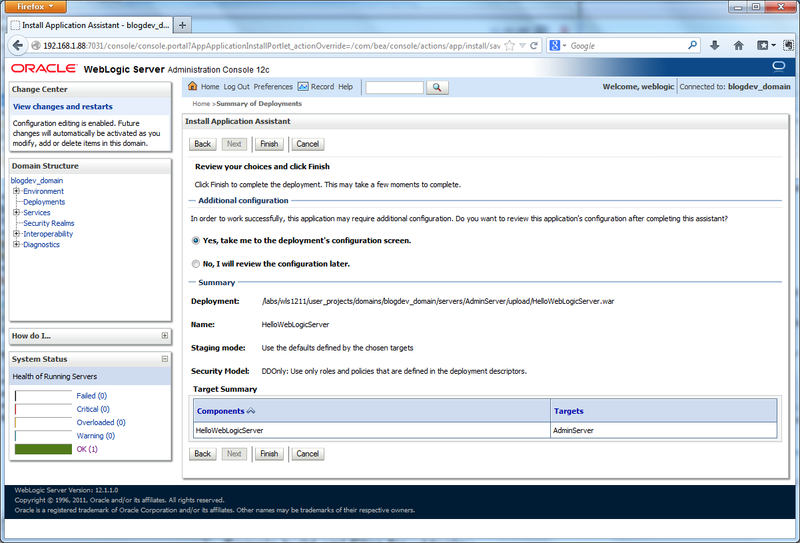 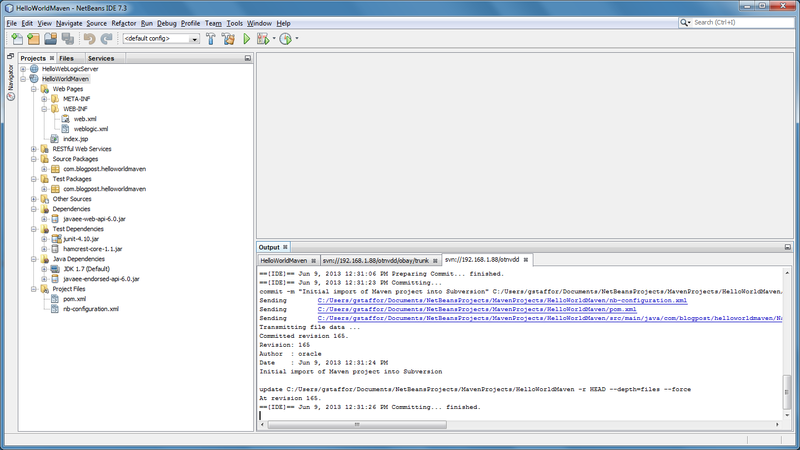 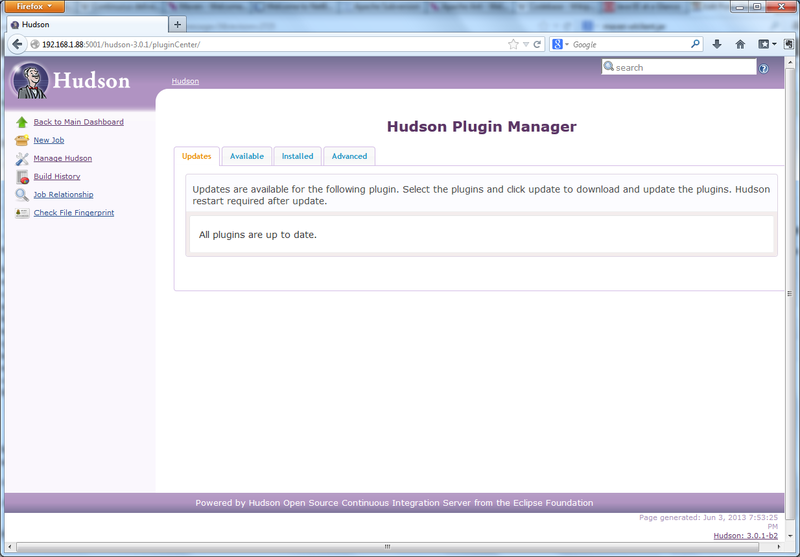 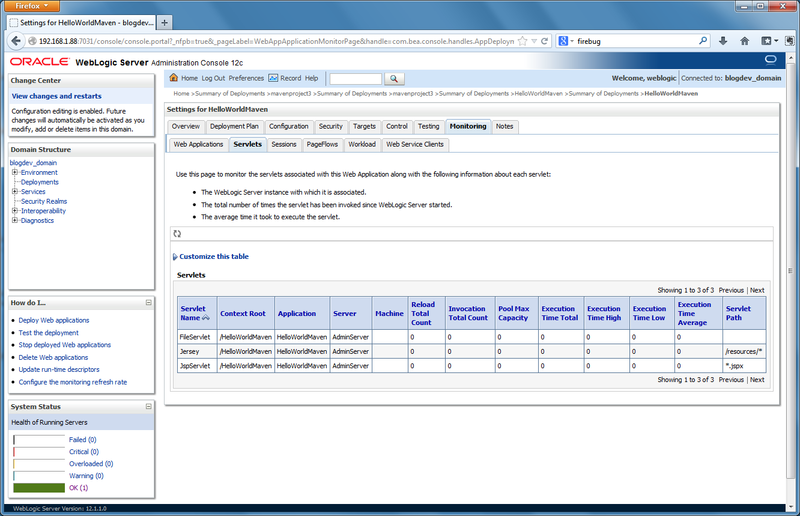 Return to the Administrative Console, and switch to the ‘Deployments’ window to view the newly deployed project. 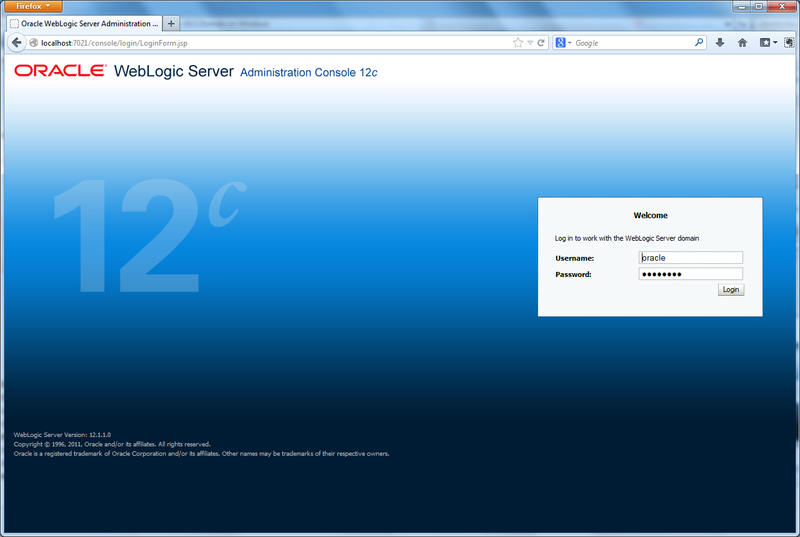 There you have it, a whirlwind WebLogic Server installation to deployment demonstration. 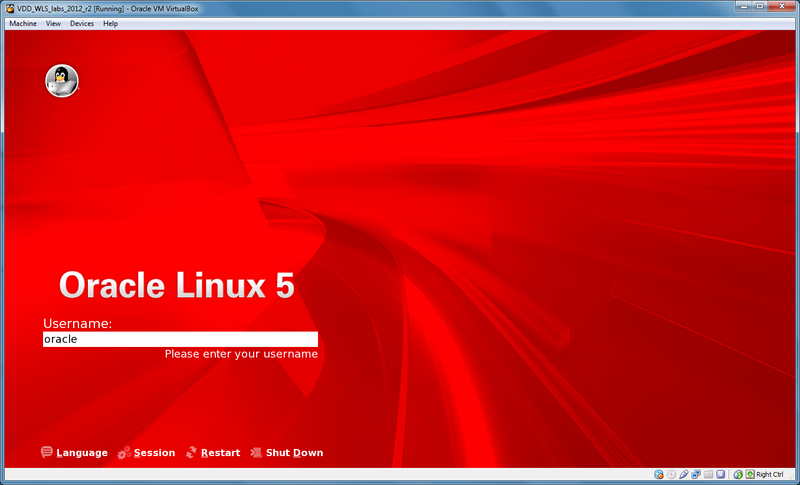 So, how long did it take you?